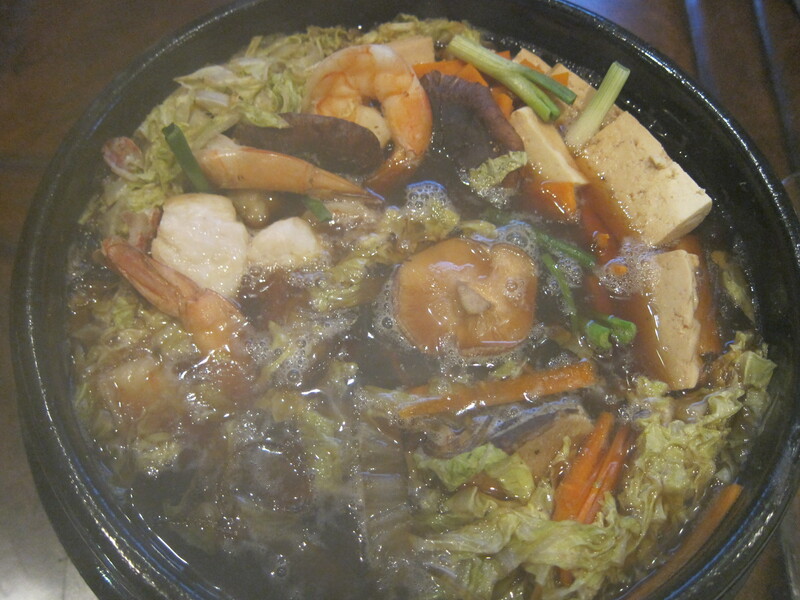 Yosenabe is a Japanese hot pot dish made with dashi, vegetables, tofu, seafood, and noodles in a nabe, which is a Japanese pot. When the pot is made out of clay, it’s referred to as Donabe, when the pot is made out of cast iron, it’s referred to Tetsunabe (Tetsu = Iron, as in Tetsuo, the Iron Man). 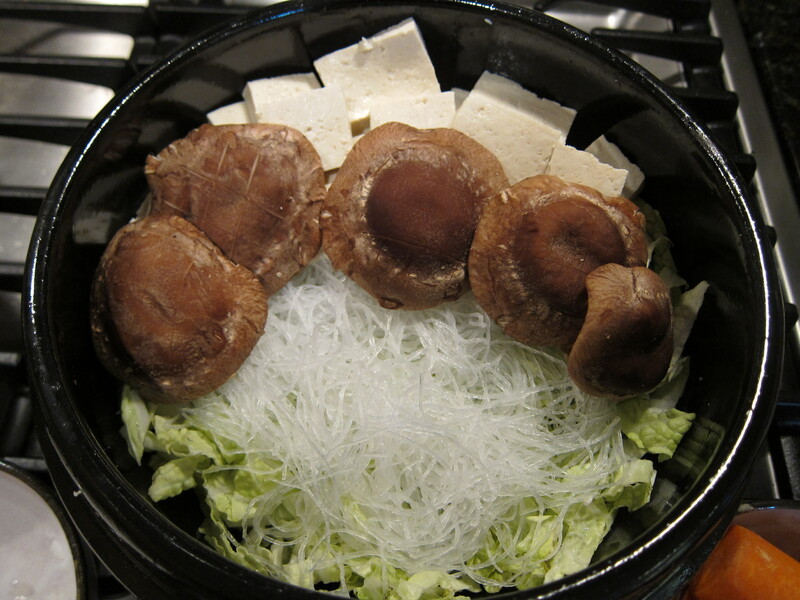 There are other types of Nabe dishes in Japanese cooking, but the Yosenabe is one of the most popular and ubiquitous ones. 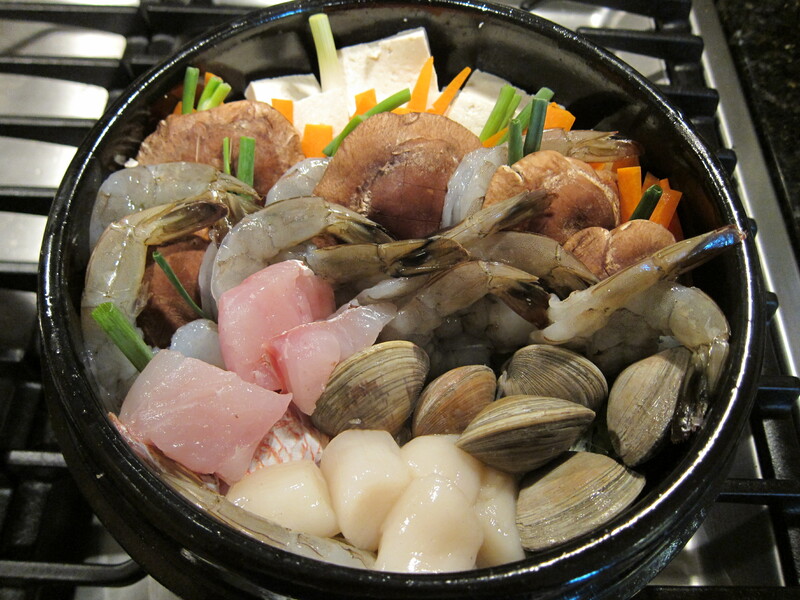 The dish is very easy to make, but time consuming in the preparation of the various type of ingredients in the Nabe. There is no set list of what ingredients you should put in a yosenabe, which makes the dish is very adaptable to your own taste. 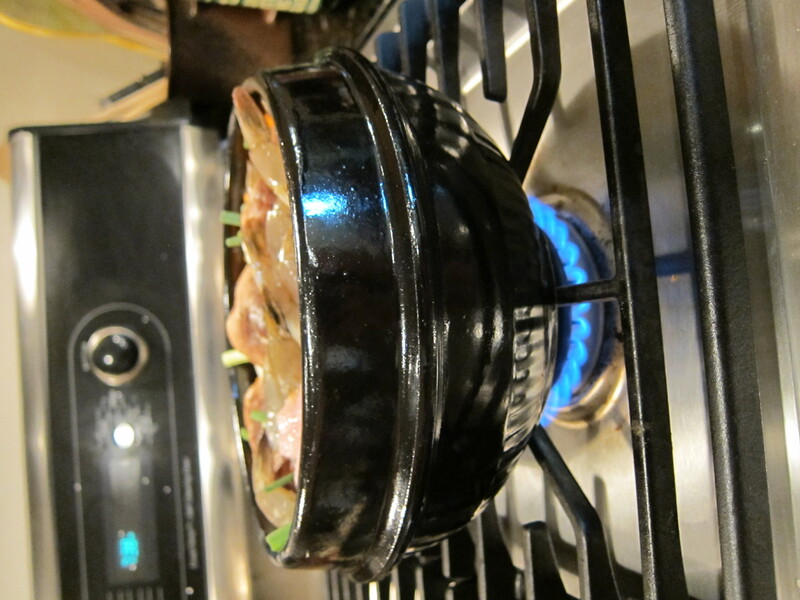 I have a Korean Clay pot that I use for Soondubu, which can double as a Donabe. If you don’t have a clay pot, you can substitute a regular pot. The soup base for my yosenabe is dashi, a broth made out of kombu (dried kelp) and shaved bonito (dried, smoked, fermented skipjack tuna). 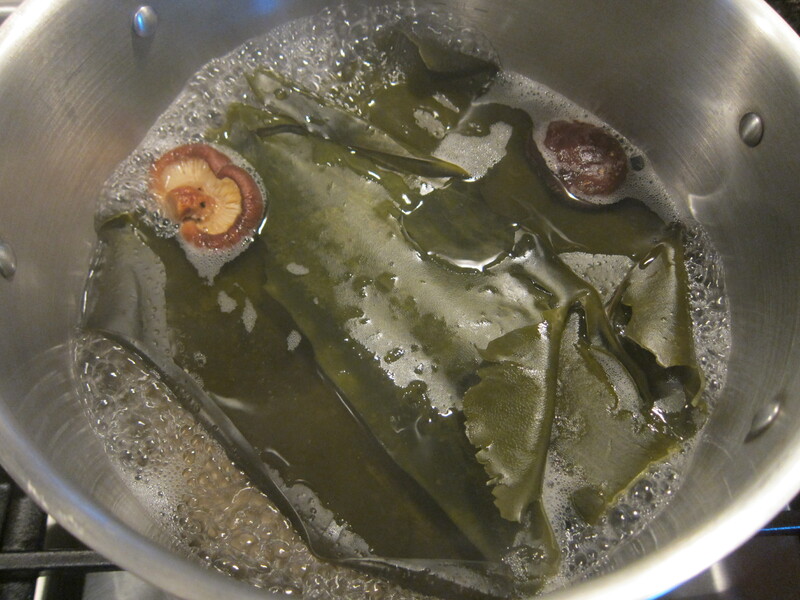 The kelp is soaked in water in a stockpot for 30 minutes, then brought to a boil. 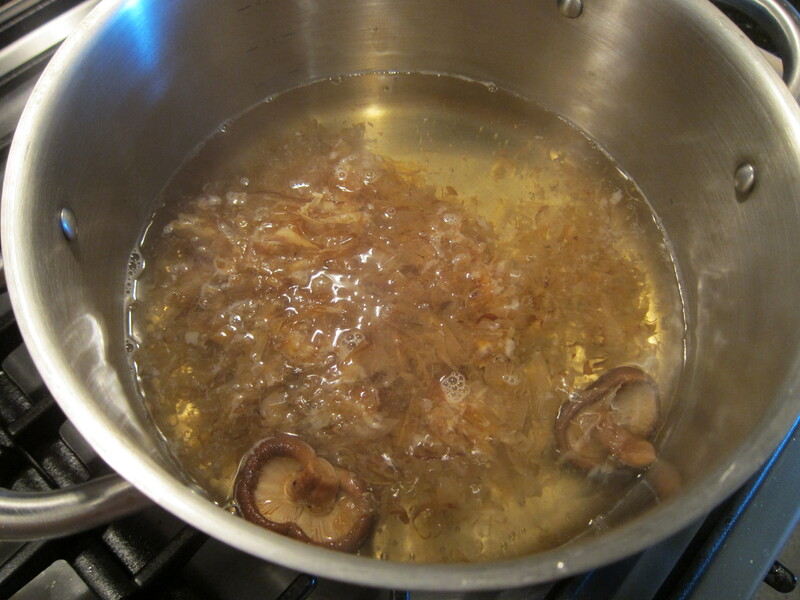 I added a couple of dried shiitake mushrooms to my broth as well. If you don’t have access to fresh shiitake mushrooms, you can substitute the hydrated dried shiitake mushrooms. 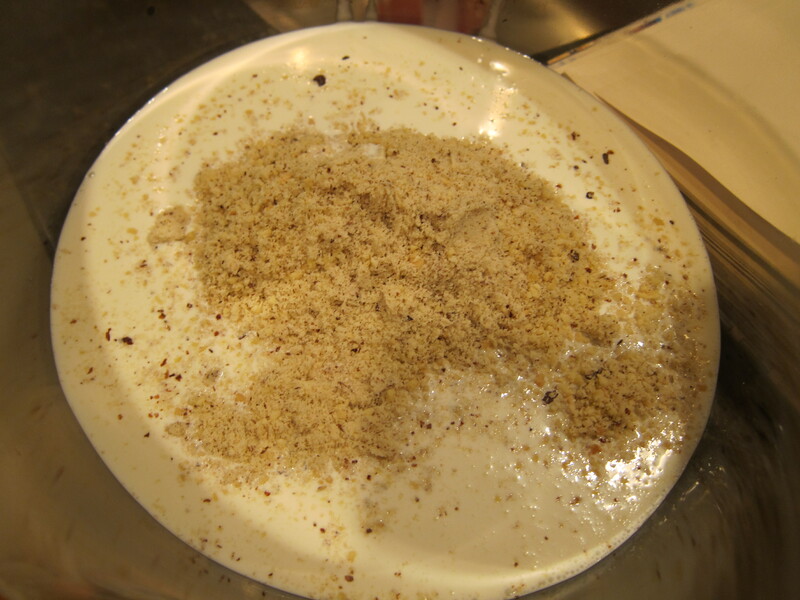 As soon as the water boils, the seaweed is removed and the bonito shavings are stirred in. Once the water reboils (which will be very quickly), the heat is turned down, and the broth is simmered for about 5 minutes. 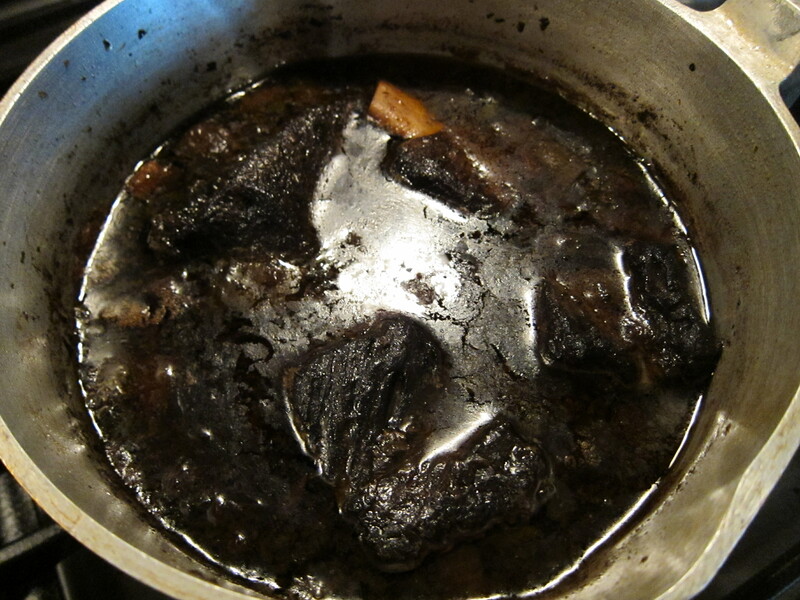 The stockpot is removed from heat, and the stock allowed to steep for 15 minutes. The liquid is then passed through a sieve, taking care not to press on the bonito flakes as it will make the broth cloudy. 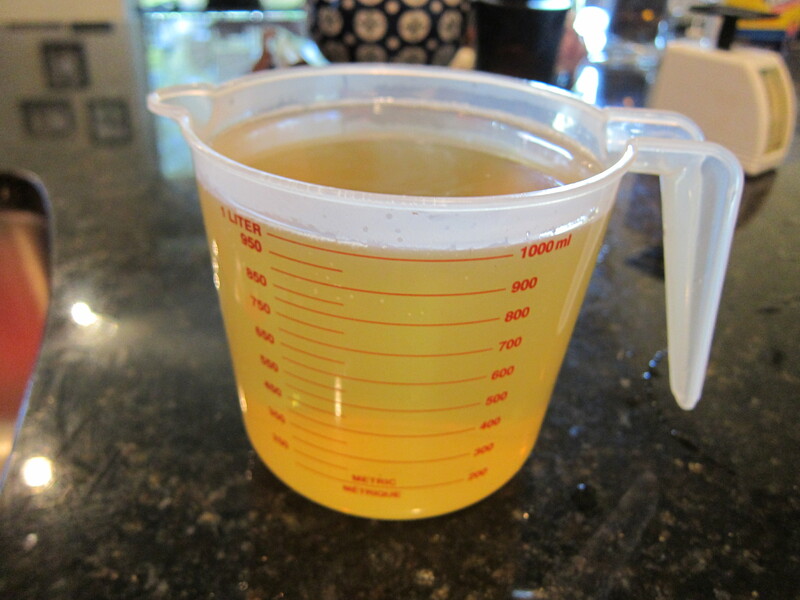 The dashi should be a golden, clear color. It is set aside until ready to be used. If you do not have access to bonito or kelp, or don’t have the time to make the dashi, you can buy dashi bouillons at Asian supermarkets. 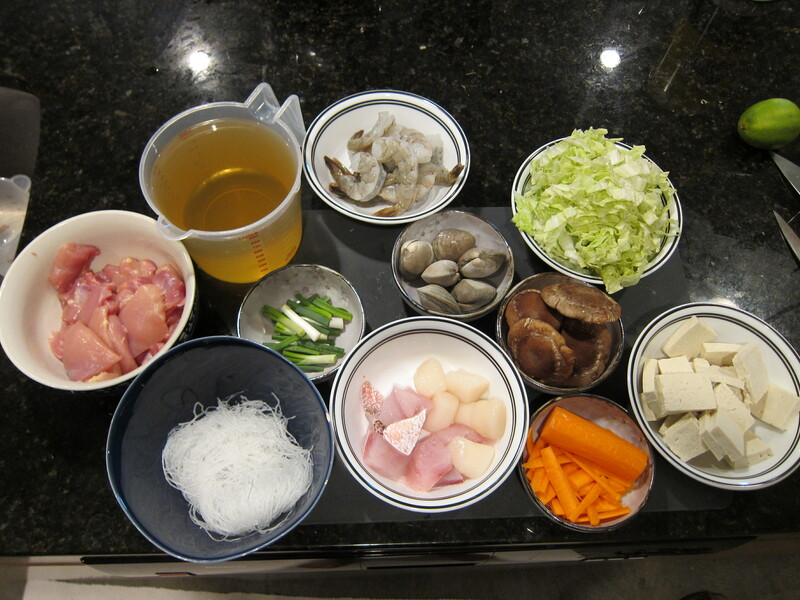 For the ingredients in my nabe, I picked cellophane noodles (soaked for 15 minutes in water, then drained), napa cabbage, tofu, carrots, scallions, and for the seafood, I used scallops, manila clams, shrimp, red snapper. I was going to use chicken thighs in the nabe, but last minute I decided to make a different dish with it. 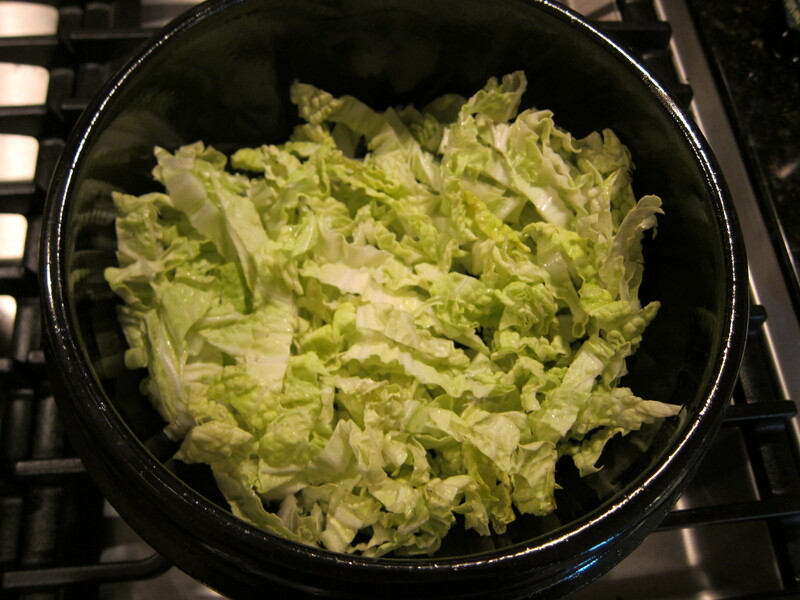 To assemble the donabe, the cabbage is layered on the bottom layer. Then topped with the cellophane noodles, the tofu, and the shiitake mushrooms. The rest of the vegetables and the seafood are layered on top of the tofu and the mushrooms in a neat fashion. 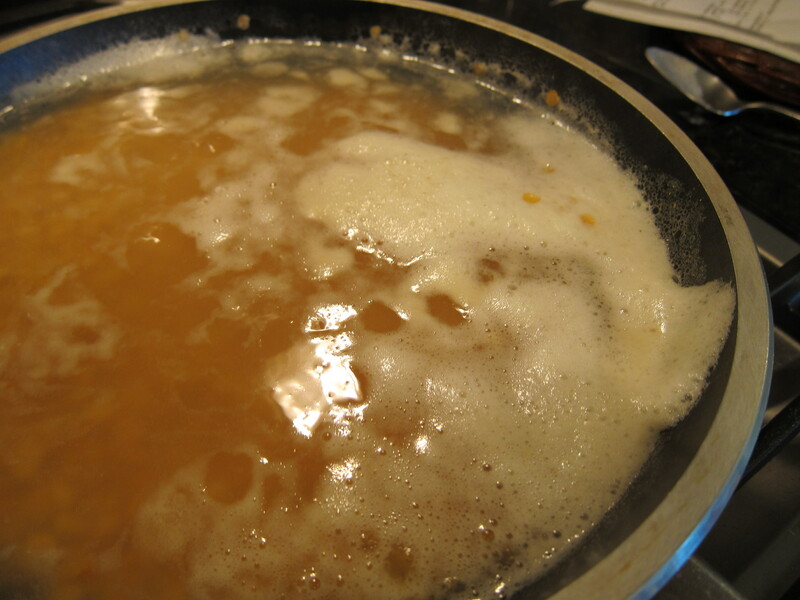 Mirin and light soy sauce are added to the dashi, and the broth is poured on top of the ingredients. The donabe is slowly brought to a boil. If you are using clams, you want to make sure they all open before the broth is done. My finished yosenabe looks a mess, becuase I was poking around, trying to make sure all the clams were open, but it still tasted delicious!!! Even though it’s a hot soupy dish, the fish, tofu, and veggies make it a very light and healthy dish that can be enjoyed year round. My boyfriend bought me a siphon for valentines day, and up until Thursday dinner, I have yet to use it. In fact, the reason why I went with Ferran Adria’s recipes is because he is an avid user of specialty cooking tools, and in his home cook book, there are a few dessert recipes were a siphon is used. If you don’t have a siphon, you can use hand mixer or stand mixer for this recipe. The siphon would give you much lighter and airier Yogurt foam, but I think the other options are a good substitute. 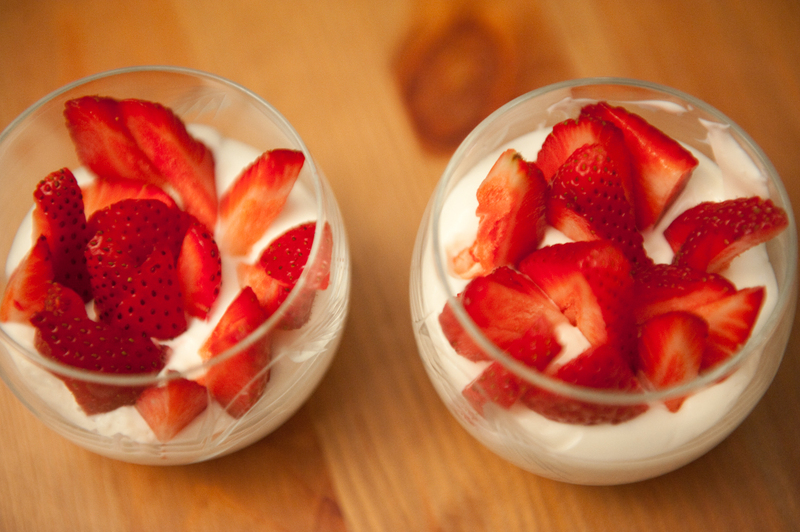 This dessert is also relatively simple to make, and very healthy. 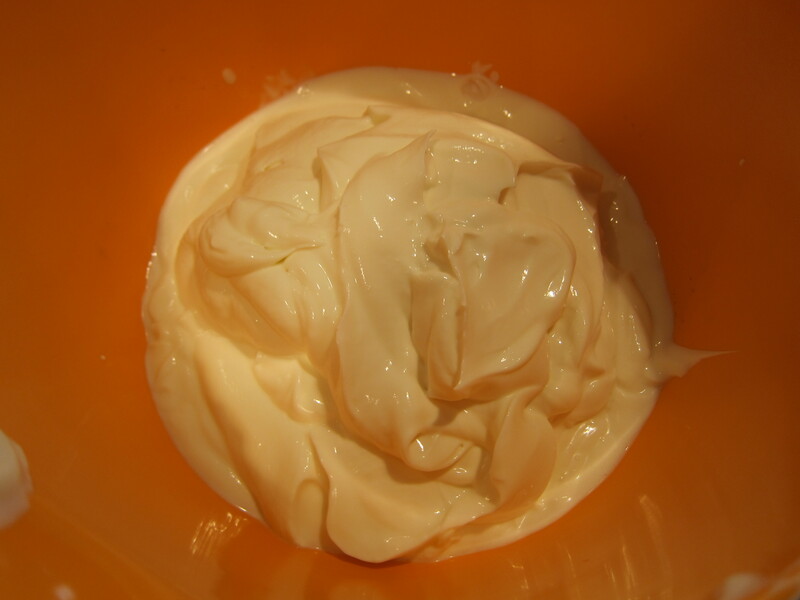 First, yogurt (I used greek style) and heavy whipping cream are stirred together in a bowl. I added a bit of honey to sweeten the foam. 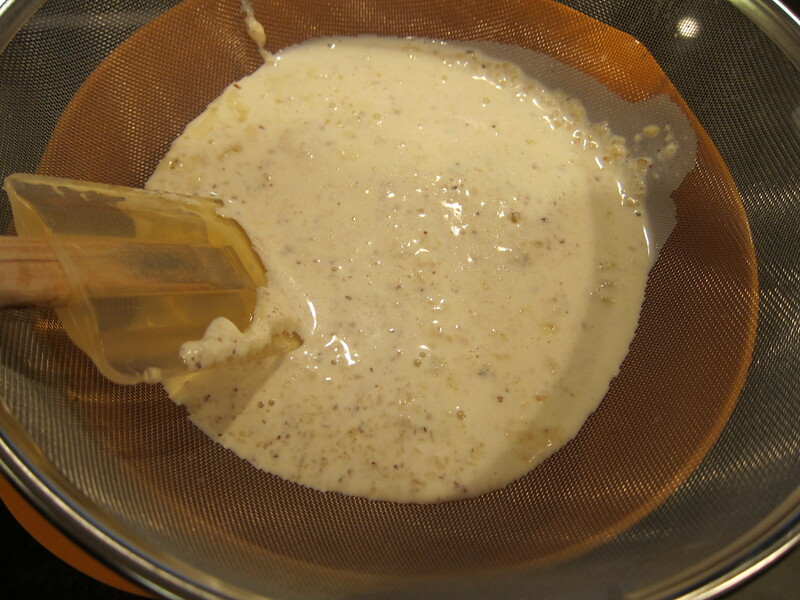 The mixture is then poured through a sieve. This step is very important if you are using a siphon, since large pieces of food will clog up the siphon during dispense. 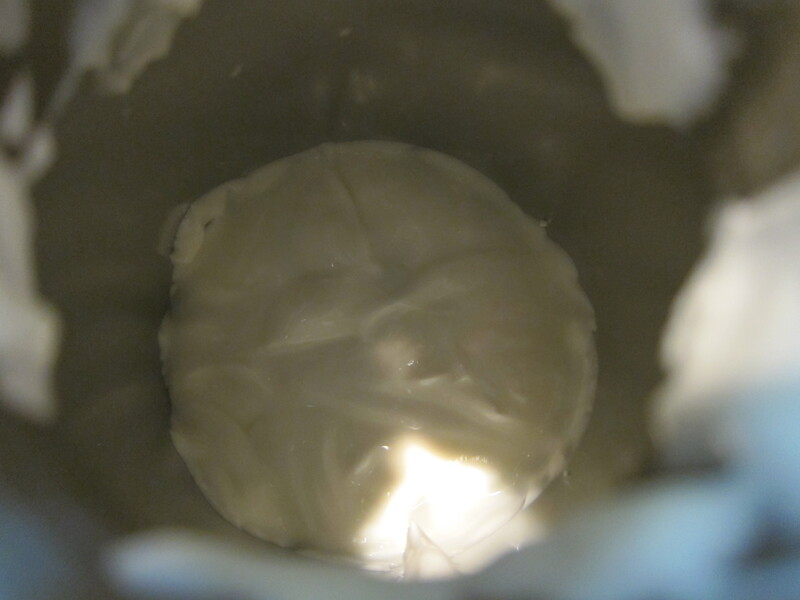 The yogurt and heavy whipping cream mixture is poured into the siphon, and chilled in the fridge for 1 hour before serving. 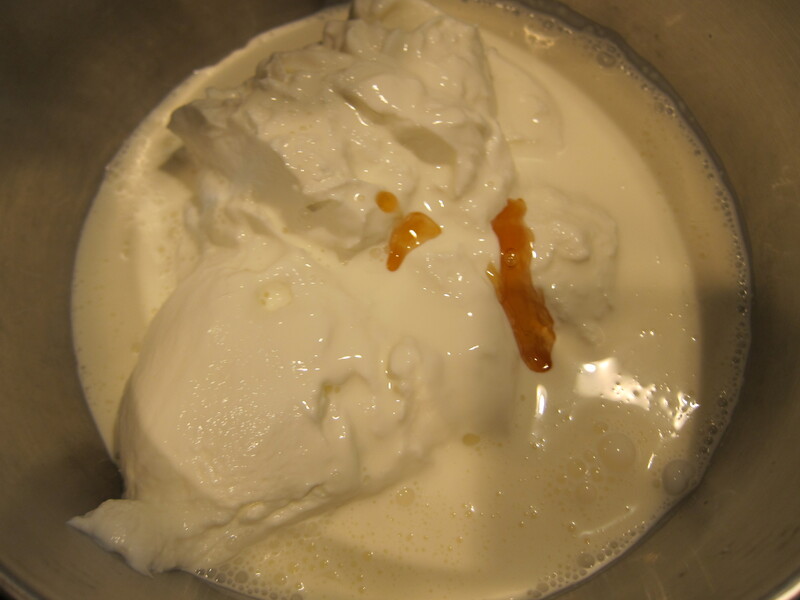 If you are not using a siphon, you can just chill the yogurt cream in a large bowl until almost ready to serve. When it’s time to serve, dispense the yogurt foam through the siphon, and top with sliced fresh strawberries. 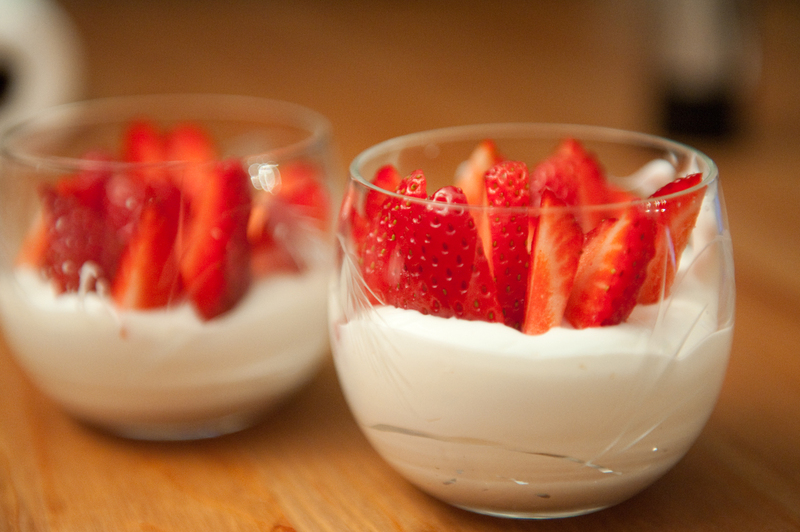 If not using a siphon, beat the yogurt cream with a hand mixer or stand mixer until firm peaks form, then divide into bowls and top with sliced fresh strawberries. 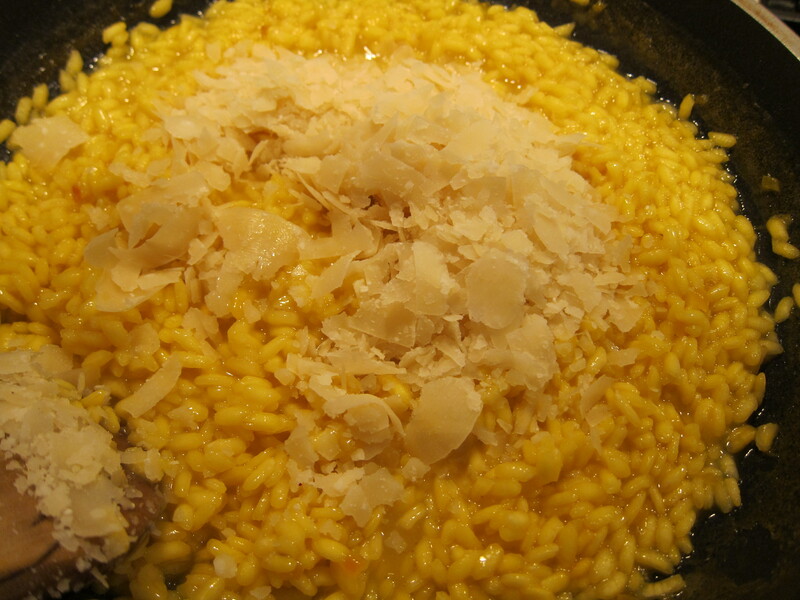 The second recipe Ferran Adria recipe I tried as a part of our Thursday dinner was a Saffron Risotto. 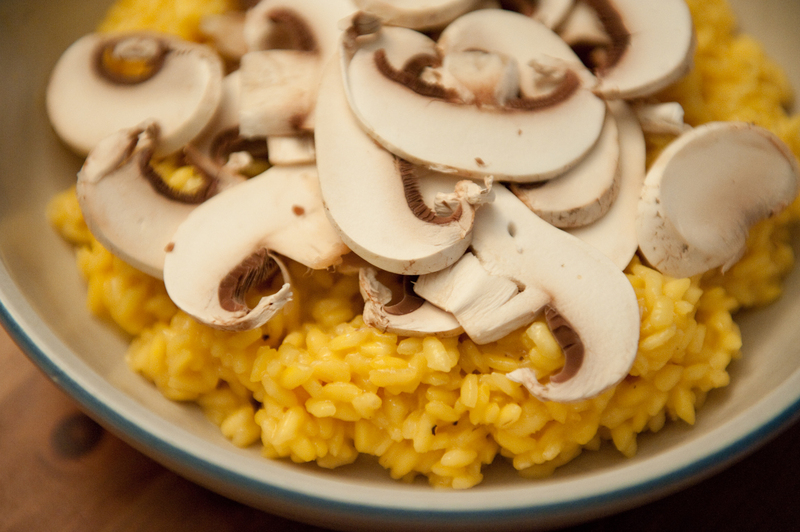 Risotto is a classic Italian dish where a high starch, short grain rice is cooked in broth and cheese to a creamy consistency. 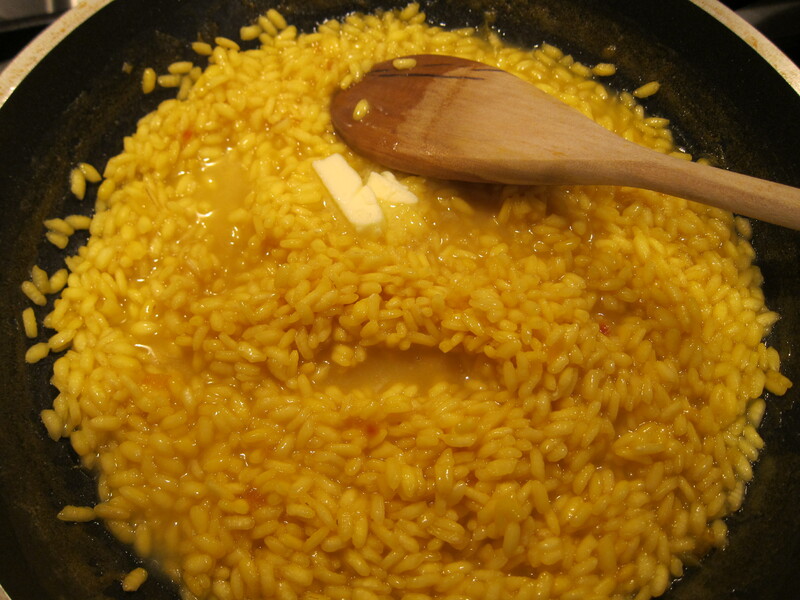 Every time I come across risotto, I always think of Gordon Ramsey’s show Hell’s Kitchen, where risotto seems to be one of the hardest dish to make. In reality, I found that if I follow the instructions, and pay attention to what I’m doing, risotto is pretty simple to make. This would be my second time in cooking risotto, and I’m really becoming a fan of it. 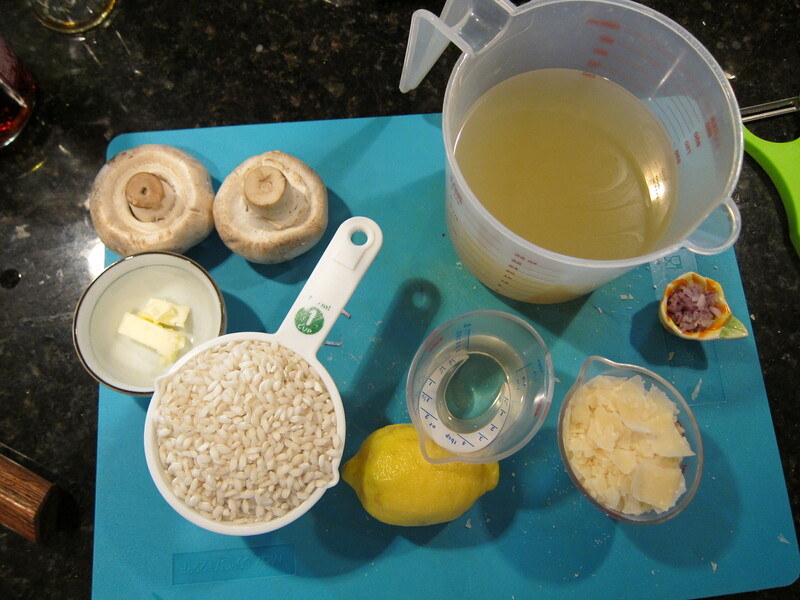 For this risotto, I needed 1 cup of Arborio rice, 2.5 cups of chicken broth, a teaspoon of shallots, fresh squeezed lemon juice, few tablespoons of white wine, 1/4 cup of Parmesan, 1 tbs of butter, and 2 white button mushrooms. The recipe calls for saffron threads, but one of my friends gave me some really good quality ground saffron that I’ve been rationing off for years, which I used for this recipe. The chicken stock is heated until boiling and kept warm on the side until ready to use. 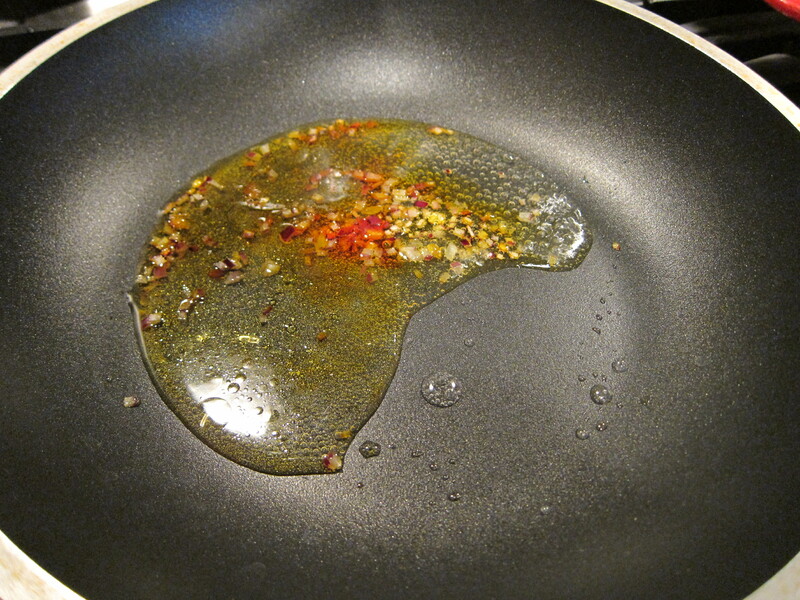 In a medium sauce pan, the shallots is sauteed on medium high heat with a little bit of olive oil, and the saffron powder, then the wine is added to the pan and cooked for a few minutes. 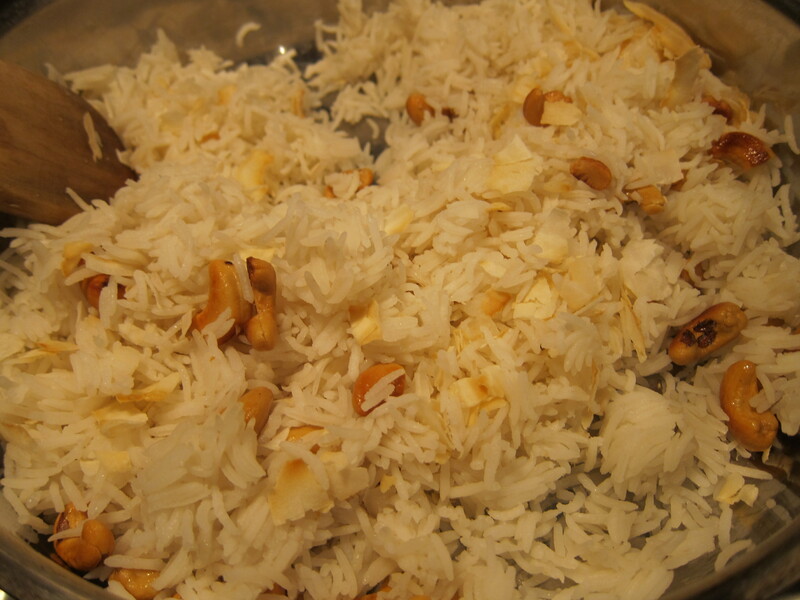 The rice is added to the pan, and cooked for 2 or 3 minutes, stirring continuously. At this point, the rice should turn yellow from the saffron powder, and a ladle of hot chicken broth is added to the pan. After scraping through the bottom of the pan, the rest of the chicken broth is added, and the heat is turned to medium. 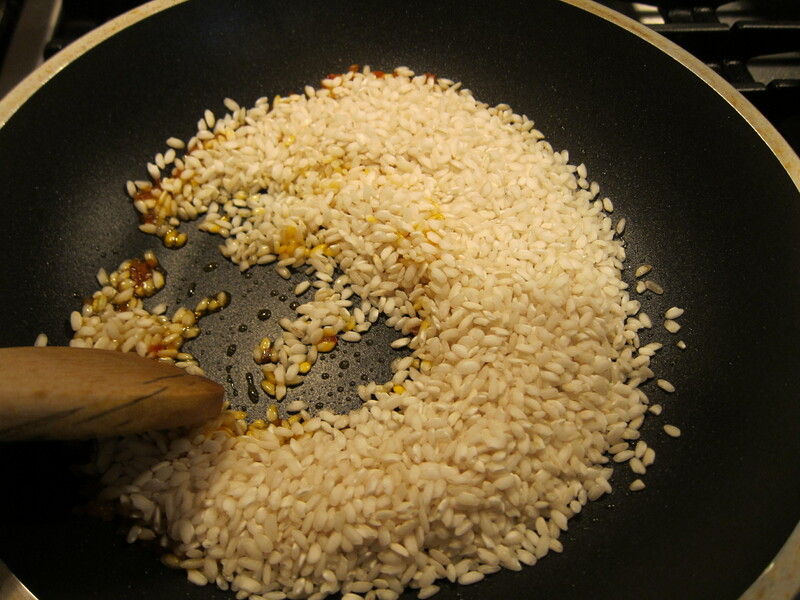 The rice is stirred and cooked on medium heat until the liquid is almost all absorbed. 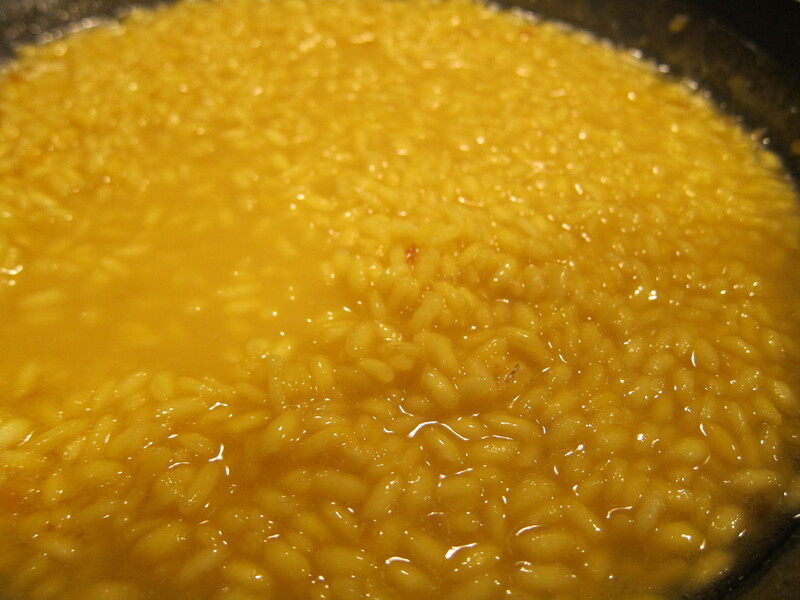 Butter and lemon juice is stirred into the risotto. 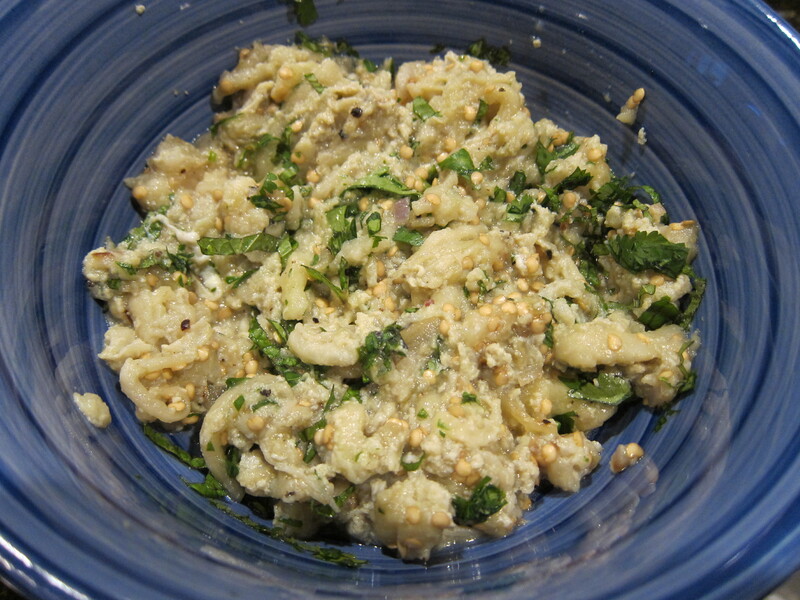 The shaved Parmesan cheese is added and stirred into the risotto until creamy. 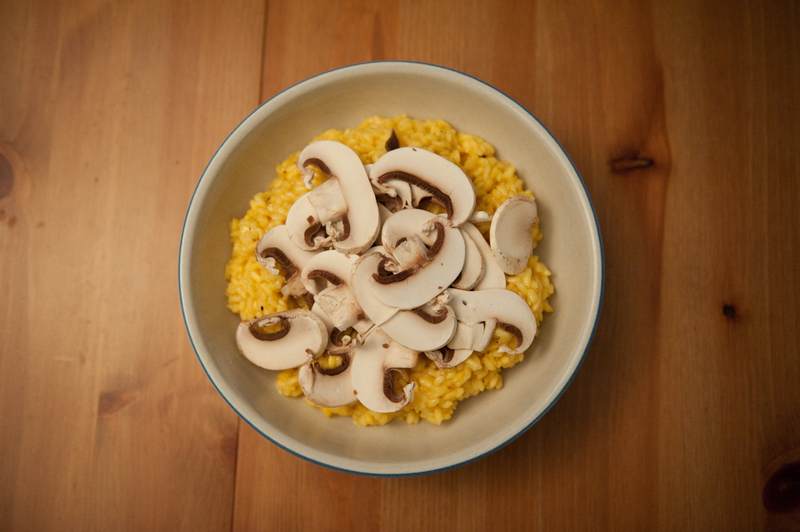 Finally, the risotto is seasoned to taste with salt and pepper, and sliced button mushrooms are placed on top of the rice. While in Marfa Texas, I visited a bookshop and found a copy of Ferran Adria’s Home cooking cookbook. Ferran Adria is the head chef of what is considered as one of the best restaurants in the world: El Bulli. El Bulli was revolutionary in that it was the forerunner for molecular gastronomy, and with only 8,000 available reservations per year and 2 million in demand, it was an exceedingly well renowned 3 Michelin star restaurant. Unfortunately it has not been a profitable business in recent years, and the restaurant has been operating at a loss for a decade or so, and it officially shut down in in 2011. While the recipes from the restaurant usually involve crazy chemical ingredients, machines, and nitrogen gas, this cook book is a collection of family meal recipes that Adria actual use for feeding his staff. The recipes are presented in menu form, with a starter, a main, and a dessert. The most popular ingredients are fresh vegetables, pastas, and fish. Each recipe also has instructions on how to cook for a party of 2, 20 and 75, which is really handy if you are thinking of dinner parties. Adria encourages readers to mix and match his recipes from different menus. The recipes are presented in a set of 10 or 20 detailed photos, and is very very easy to read and follow. The menu I decided to to try is a Catalan style turkey leg, saffron risotto, and fresh strawberries and yogurt foam. 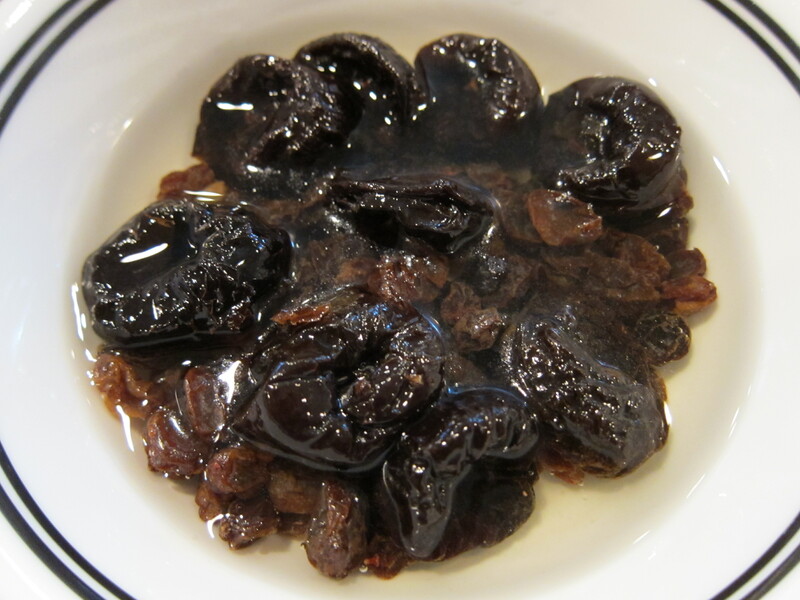 For the turkey legs, first, some dried prunes and raisins are soaked in dry sherry. 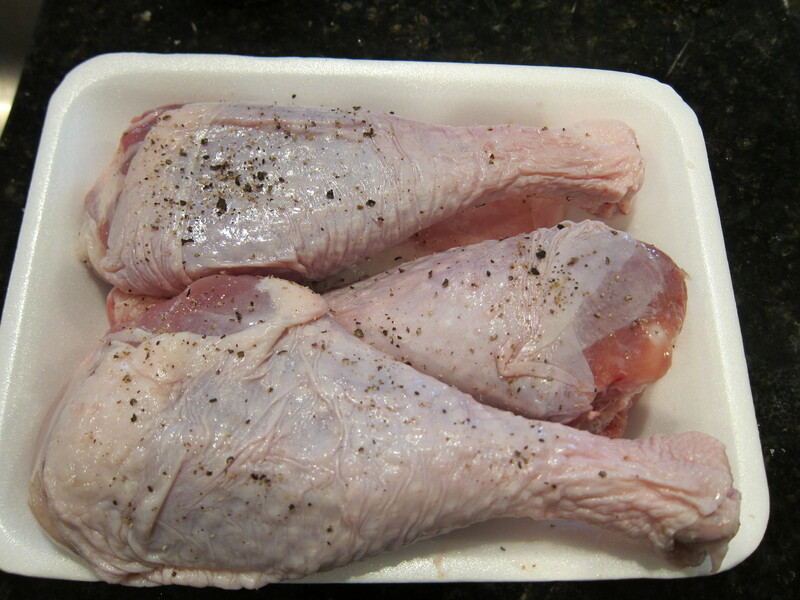 The turkey legs are seasoned with salt and pepper. 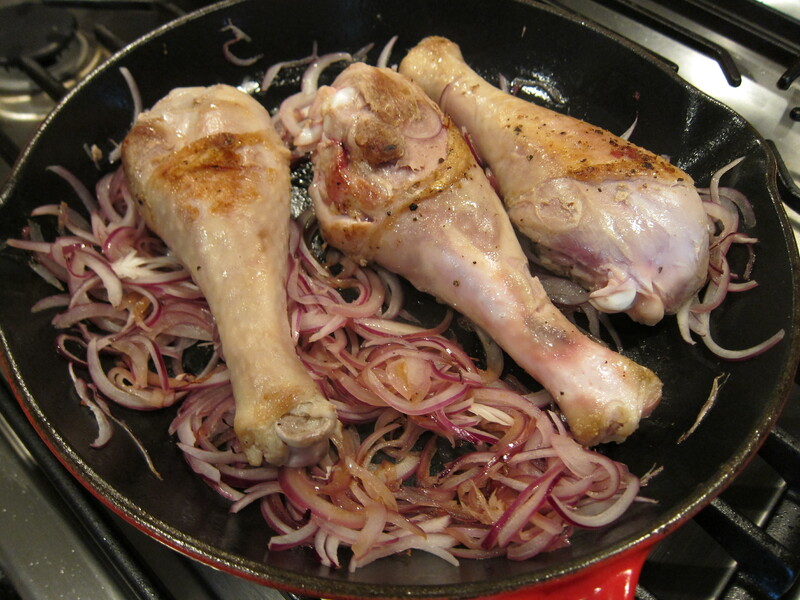 Then the legs are cooked in a medium hot pan until browned on all sides. 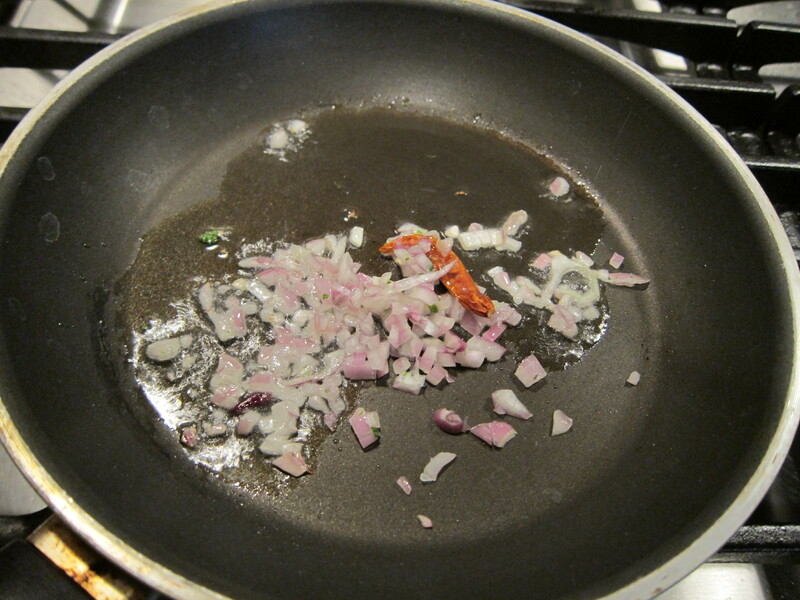 Thinly sliced red onions are added to the pan, the heat is lowered, and the onions are cooked until carmelized. The sherry from soaking the dried fruits are added to the pan to deglaze, scraping up the bits on the bottom, and chopped tomatoes are added to the pan. 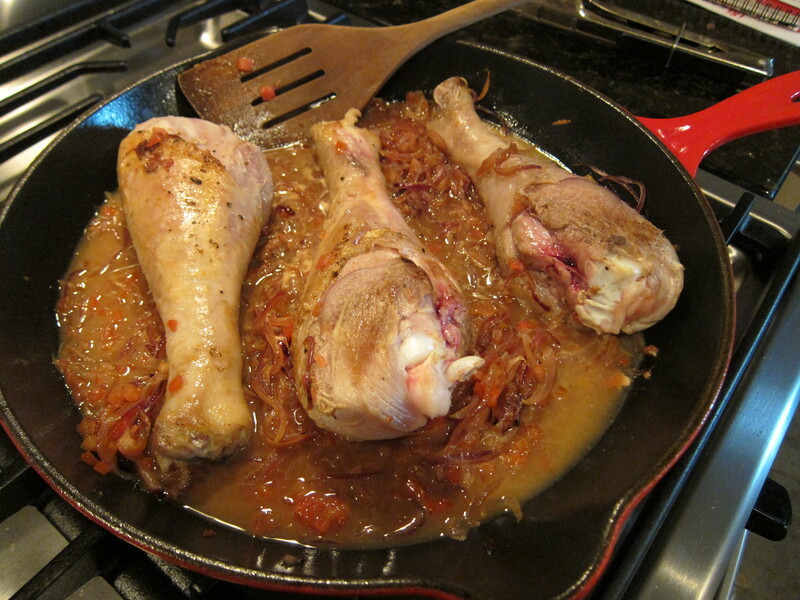 The legs are cooked for 30 minutes, uncovered, on low heat, then water and the dried fruits are added to the pan, and the legs are covered and cooked for 1 hour more. 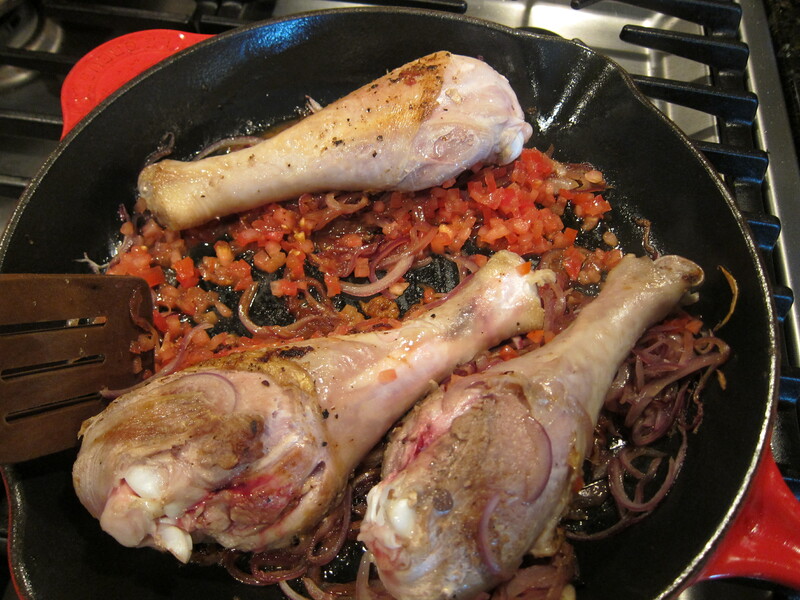 Right before the turkey is ready to be served, I toasted some pine nuts with some oil in a small pan, and sprinkled the turkey legs with them. 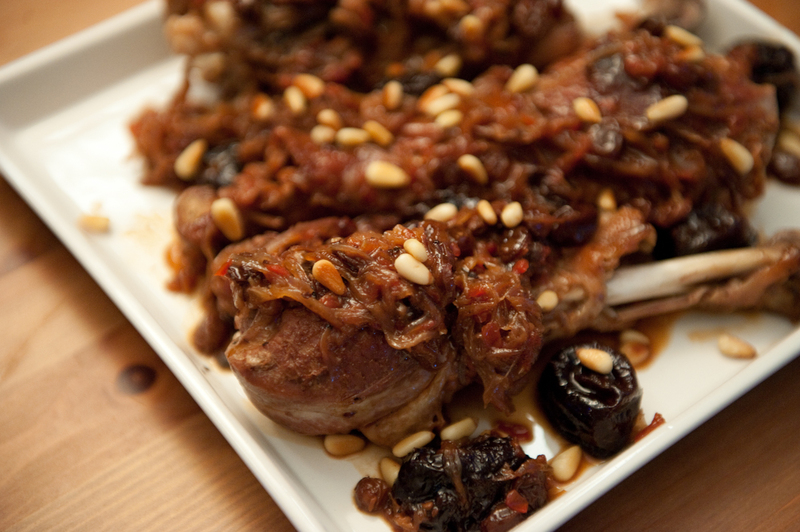 Turkey legs are cheap and healthy, and this recipe really uses simple ingredients to bring out the natural flavours of turkey. 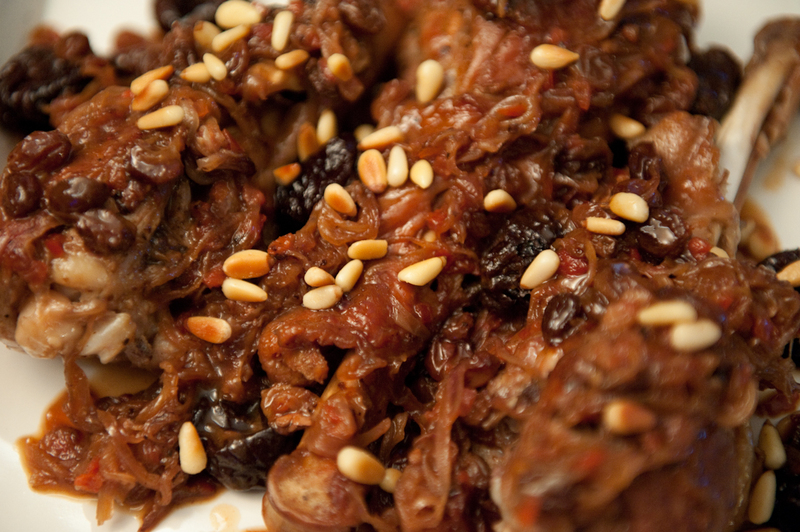 The addition of prunes and raisins lends a delicate sweetness to the dish, and the toasted pine nuts a crunchy texture. My boyfriend loves Italian food like chicken parmesan and fettuccine alfredo. We also know how bad these foods can be for you if you eat them often. I decided to make a healthier version of chicken parmesan and pasta by substituting eggplant for chicken, and adding chicken sausage and kale to the fettuccine and skipping the alfredo sauce completely. Eggplant Parmesan, or any type of ____ Parmesan is composed of the protein or vegetable battered and fried, then baked with layers of mozzarella, parmesan, and tomato sauce. It’s almost impossible for this dish to taste bad with the cooking process and ingredients! If you mess up on one area of cooking, there are other areas that you can work on to fix the dish, and that’s why I love making anything Parmesan. To start the dish, eggplant slices are sprinkled with salt, and placed over a colander for 30 minutes until the moisture is released from the eggplant. Releasing the water from eggplants will help the overall dish be firm and not soggy. While the eggplant is draining, the tomato sauce is made. 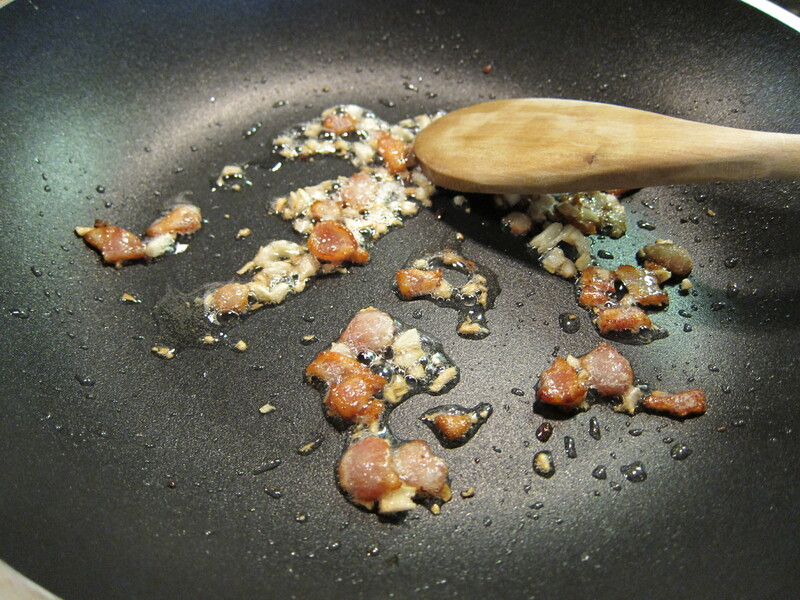 Instead of using olive oil to fry up the garlic, I used 1 chopped up slice of bacon to render up some bacon fat, and cooked the garlic until golden. Next, hand crushed canned whole tomatoes and fresh basil leaves are added to the pan along with salt and pepper, hot chile flakes, and simmered for 30 minutes until thick. The recipe called for fresh peeled tomatoes, but I found canned whole tomatoes a good fast substitute. 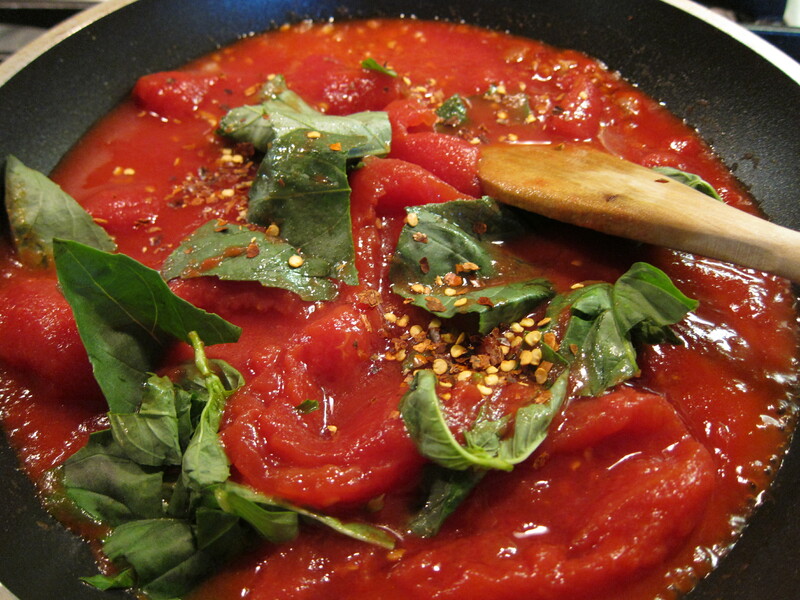 The tomato sauce is set aside until ready to use. After the eggplant slices are drained, they are patted dry on paper towels. 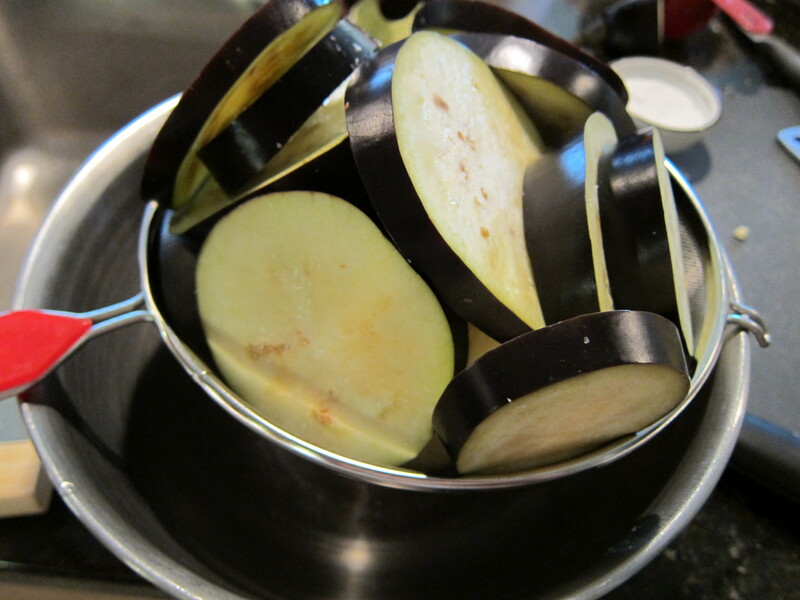 An inch of oil is heated in a large pan, and the egg plants are ready to be battered and fried. First they are dusted in flour, shaking off the excess when you are done. 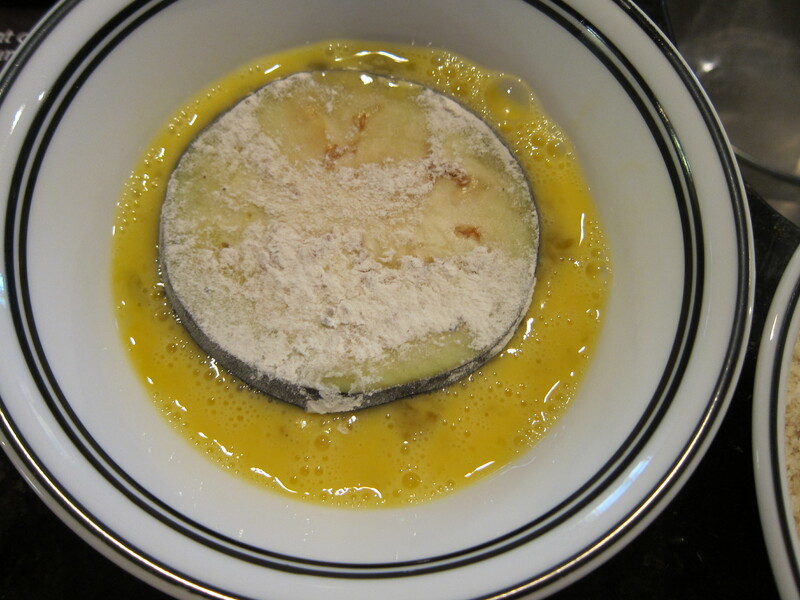 Then the flour dusted eggplant slices takes a dip in an egg bath. 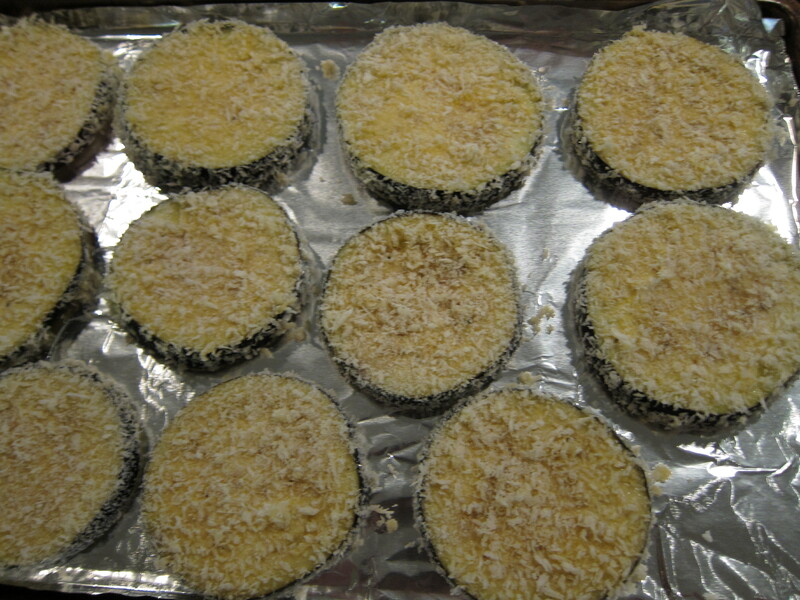 Then the egg covered eggplants are battered with panko crust, shaking off the excess. All the eggplant slices are battered and placed in a pan until ready to be fried. 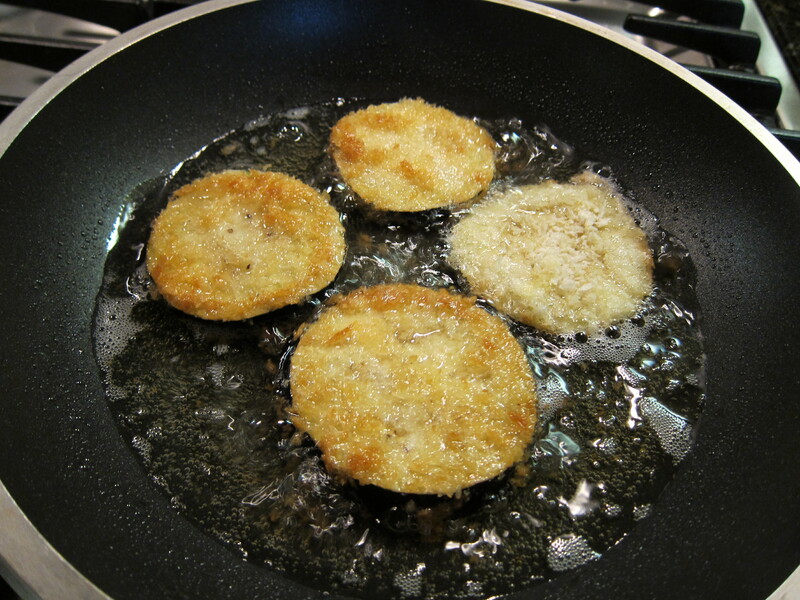 The eggplant slices are fried in the pan with the heated oil until brown on both sides. 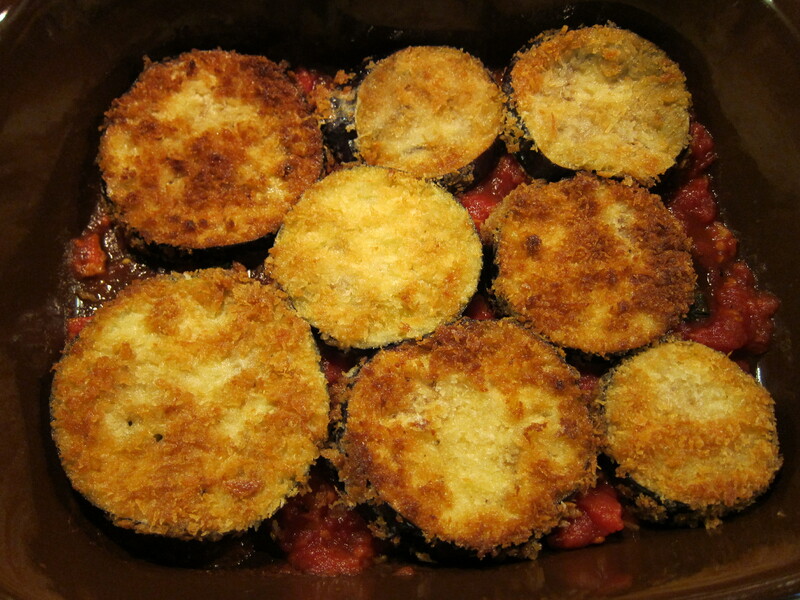 When ready to assemble the eggplant parmesan, a layer of tomato sauce is placed on the bottom of a baking dish, then a third of the eggplants are layered on top of the tomato sauce. 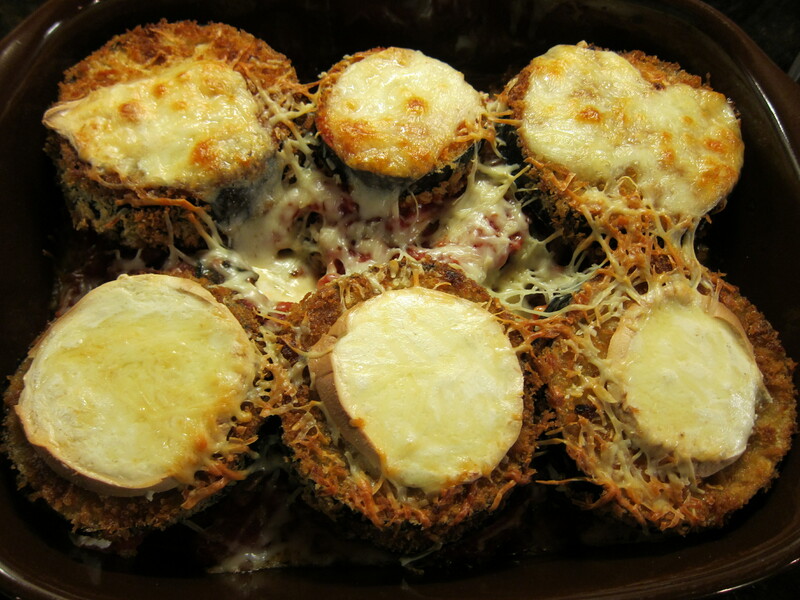 Then a a layer of sliced mozzarella cheese is layered on top of the eggplants, and the process is repeated twice. 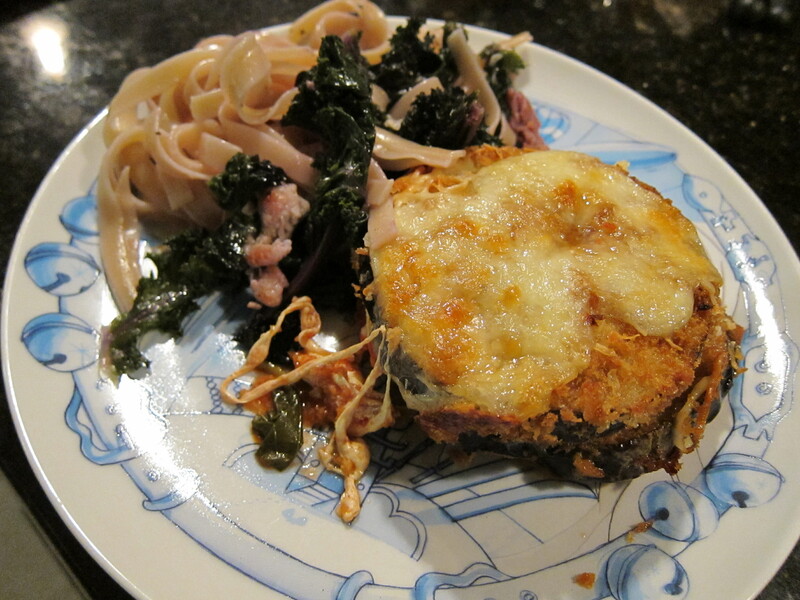 The eggplant parmesan is baked in a 375F degree oven for 40 minutes until the cheese is brown on top. 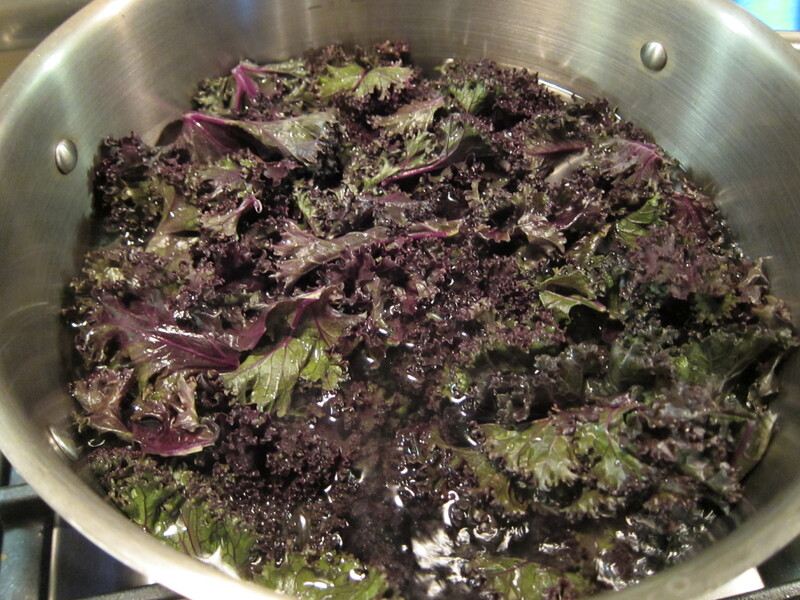 For the Fettuccine, Kale is chopped and cooked in a boiling pot of water for 6 minutes and drained. 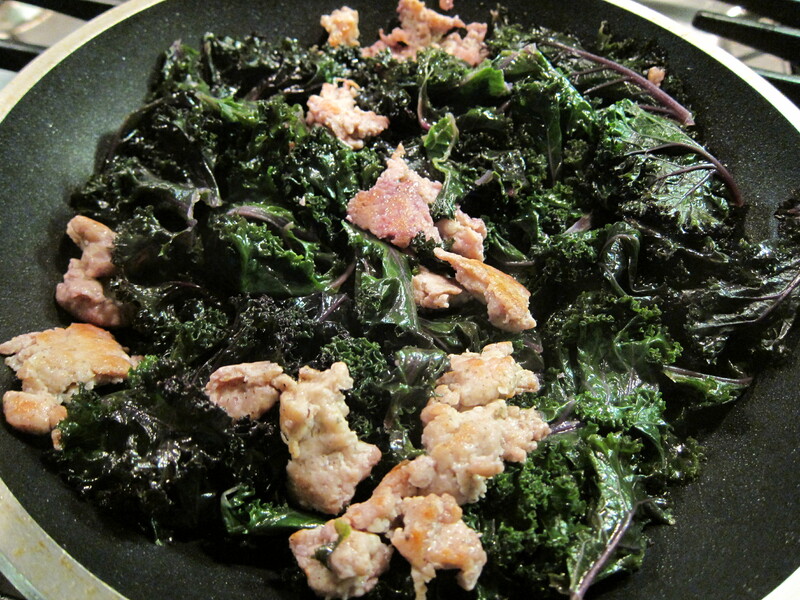 Some chicken sausage is browned in a pan, and the kale added to the sausage. 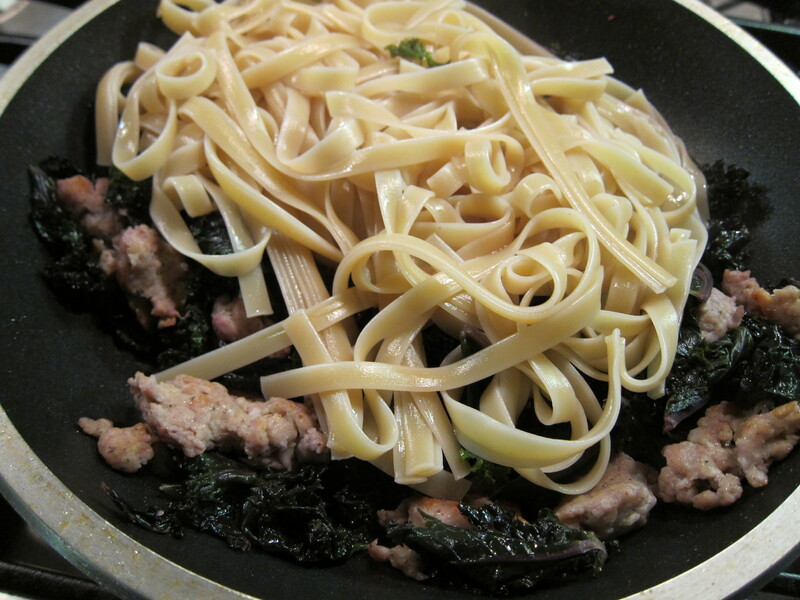 Then chicken broth is added to loosen up any browned bits on the bottom of the pan, and cooked fettuccine is added to the pan with kale and sausage. 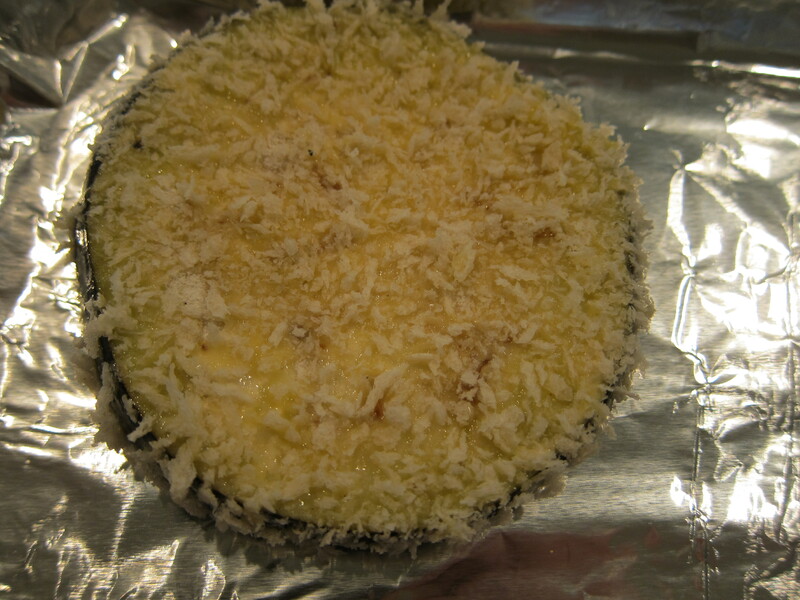 The dish is finished up with some shaved pecorino cheese. Food and Wine showcased three recipes from Naomi Duguid, a Canadian food writer who came out with a new book of Asian recipes. I usually am very skeptical of cookbooks written by people who are not from the region of cooking they are writing about. A Canadian writing about Asian food? I definitely had my doubts, but one of the recipes, the Thai chicken with Hot-Sour-Salty-Sweet Sauce, was the cover recipe, and man did it look tasty. 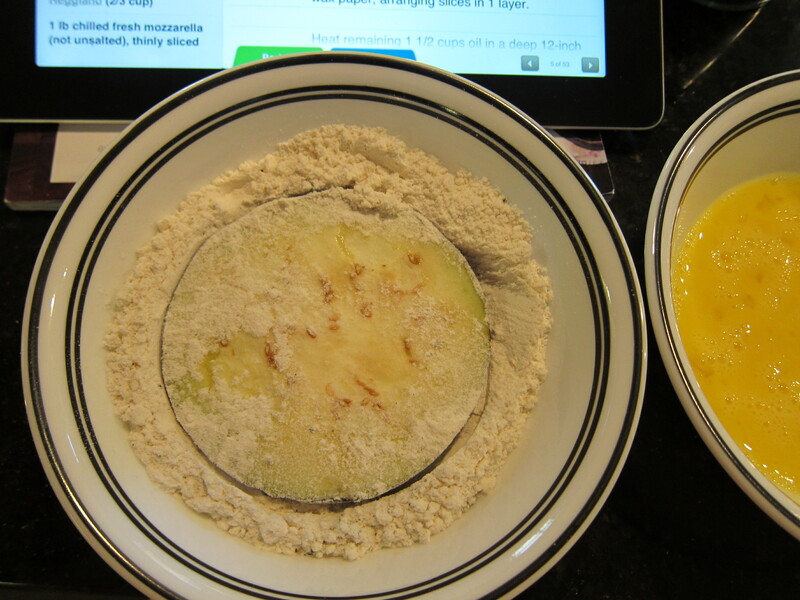 The other two recipes looked very good as well, so I decided to try all three for dinner. 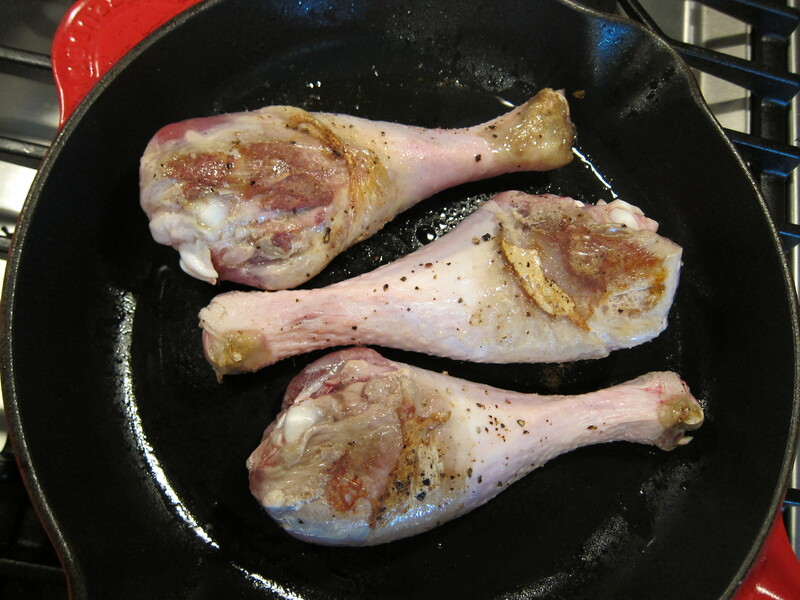 To make the chicken, whole chicken legs are skinned and additional fat removed. 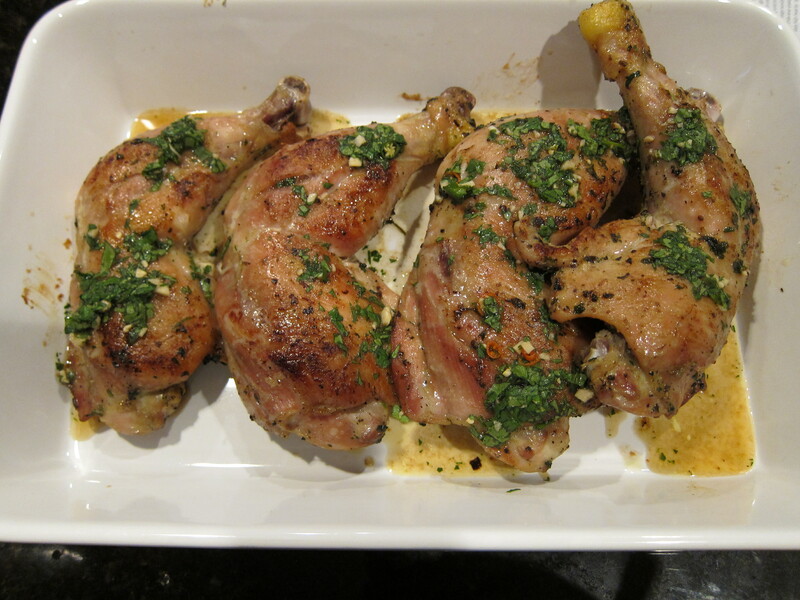 The legs are marinated in a mix of cilantro, Asian fish sauce, and black pepper, chilled in the fridge for 4 hours. 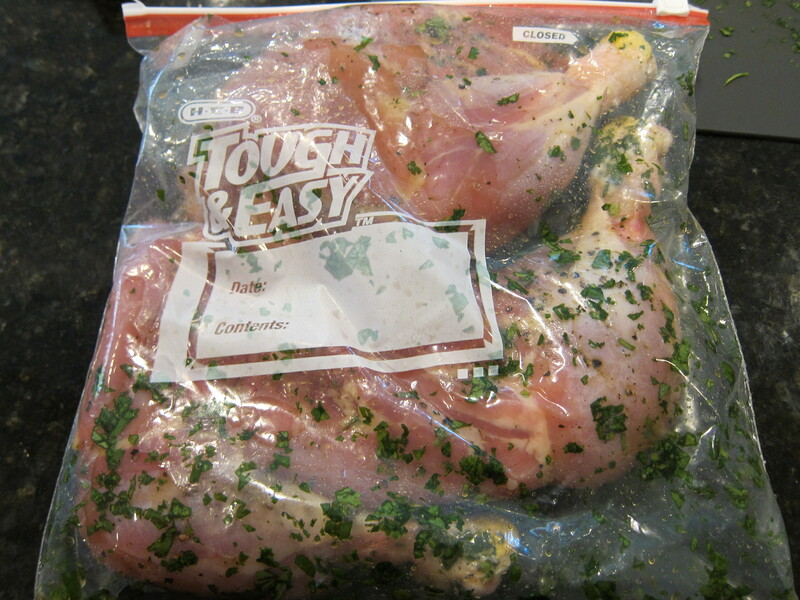 If you don’t have time, you can marinate the chicken legs at room temperature for 30 minutes. After the chicken finishes marinating, it’s seared on a hot pan until nicely browned, about 6 minutes per side. The recipe called for the chicken to be grilled, but I didn’t feel like setting up my Webber charcoal grill for 12 minutes of grilling, and I felt pan roasting worked out pretty well. 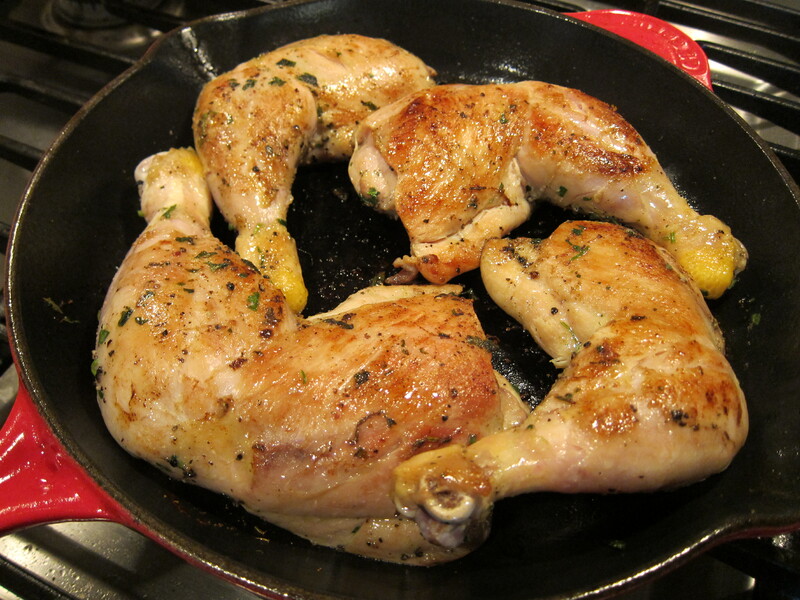 The pan is then placed in a 400 degree oven for 30 minutes, until the chicken is cooked. While the chicken is cooking, the dipping sauce is made by combining tamarind concentrate, sugar, fish sauce, lime juice, garlic, and cilantro. After the chicken was done cooking, I spooned a couple table spoonful of the dipping sauce over the chicken, and served the chicken with the extra dipping sauce on the side. 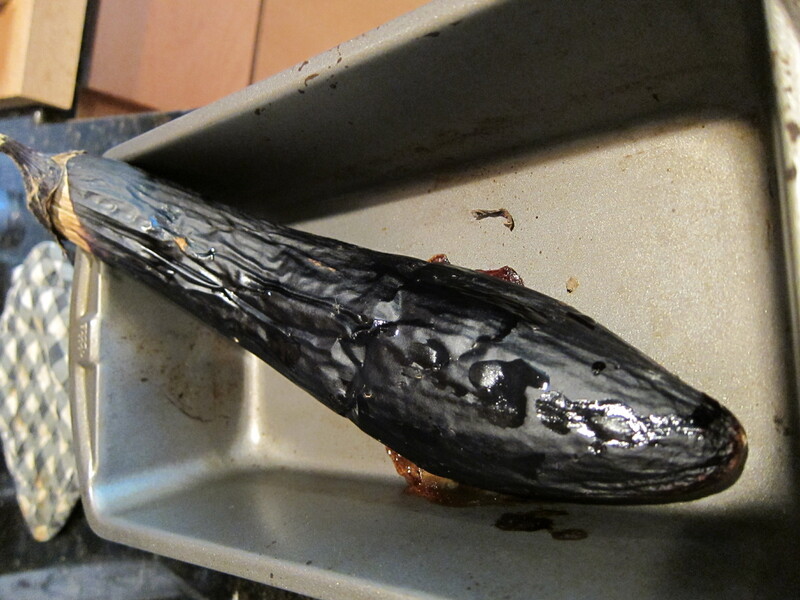 To make the eggplants, a whole Chinese eggplant is roasted in a 450 F oven until very soft and charred on the outside. 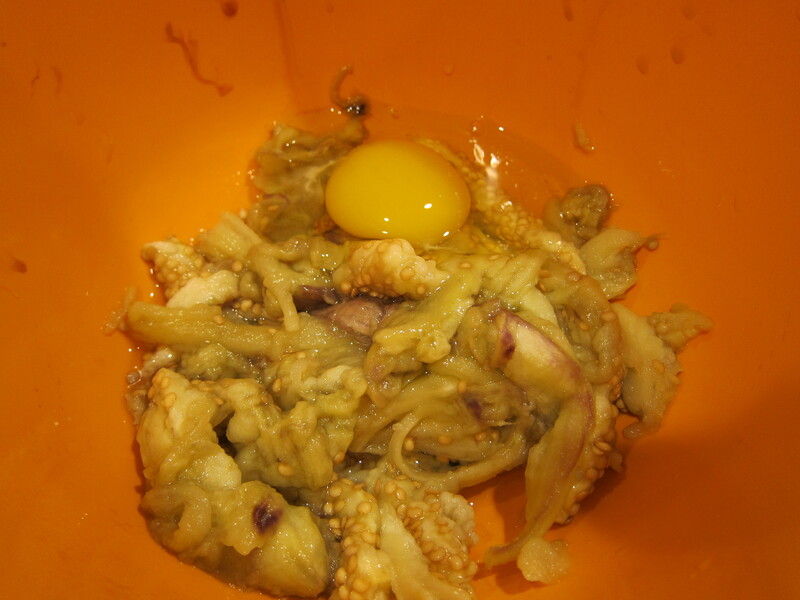 After the eggplant cools, the flesh is scooped out, and an egg is beaten into the eggplant flesh. 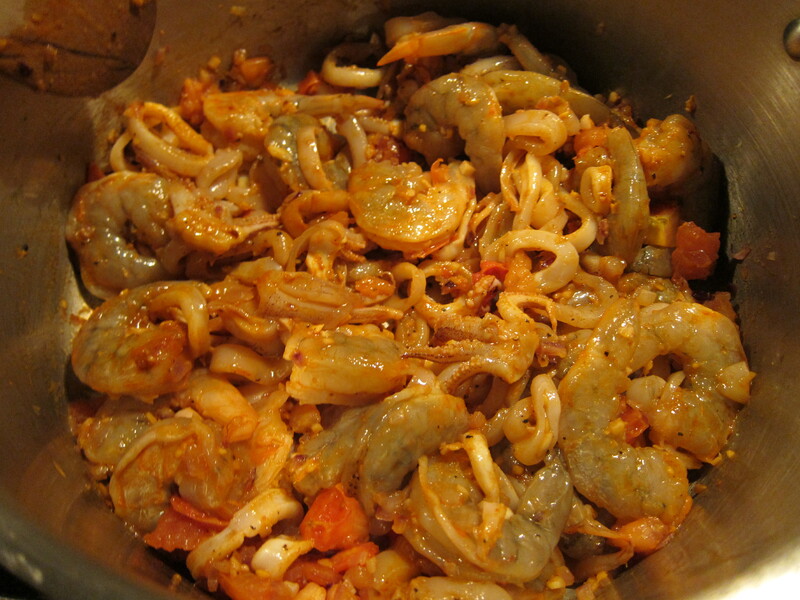 To cook the dish, some chopped shallots and dried chile pepper are cooked over medium high heat until fragrant. The eggplant mixture is stirred into the pan and cooked for about a minute, until smooth. The dish is finished off with some chopped mint and cilantro. 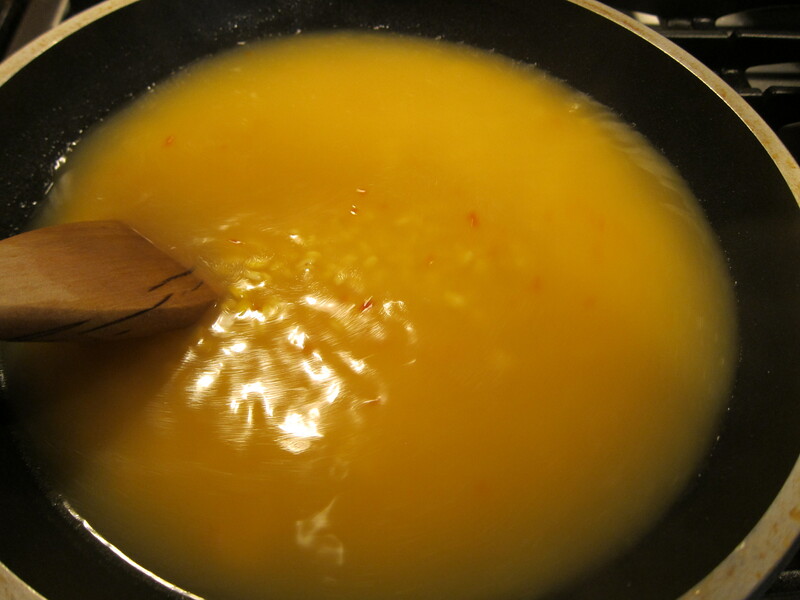 To make the red lentils, or masur dal, the lentils and water are brought to a boil, tumeric is added and the lentil is simmered at low heat until they break down. You can skim the foam that forms on the surface of the water as it cooks. The dal is set aside until ready to use. 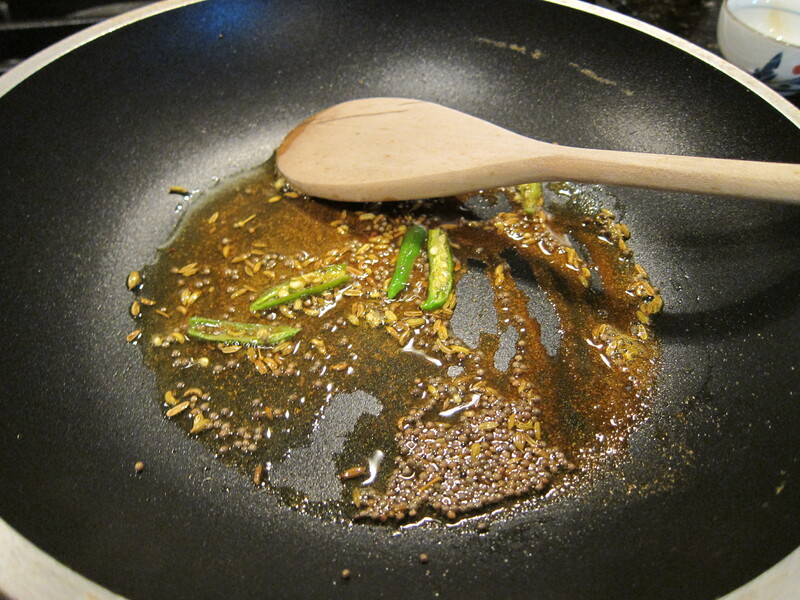 While the lentil cooks, coriander, fennel seeds, fresh green chile, and mustard seeds are cooked until fragrant in a large pan with some oil. 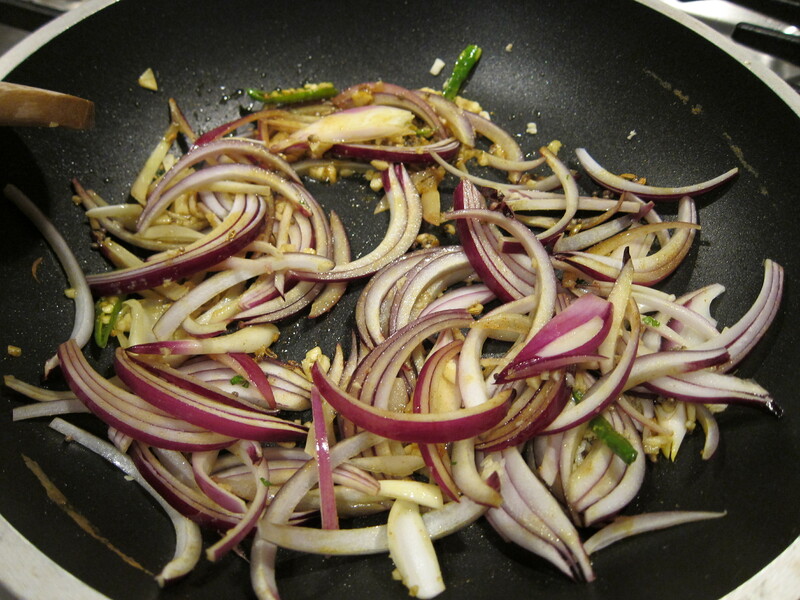 Then chopped ginger and sliced onions are added to the pan and cooked over low heat until soft. 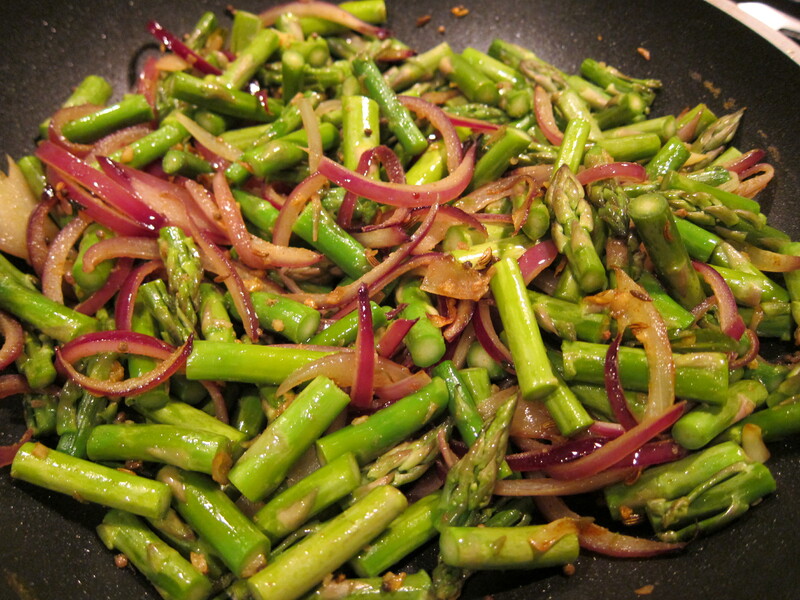 The asparagus are cut into 1 inch lengths and are added to the pan and cooked until crisp tender. 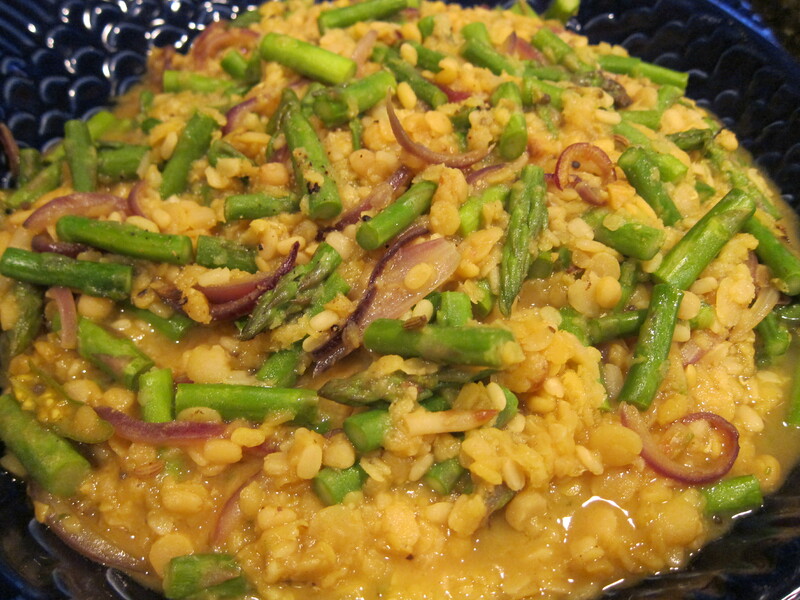 The cooked dal is added to the pan along with some tamarind concentrate and brought to a simmer. 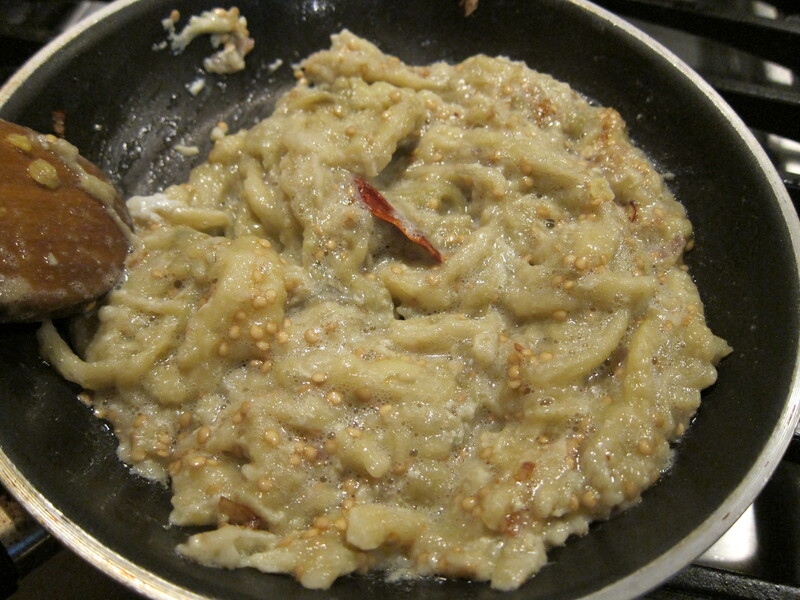 The dal is seasoned to taste with salt and pepper and served. At the end of each recipe, there was also a listing of nutritional information, and all three recipes looked extremely healthy! Each serving of the chicken was only 177 calories, and my boyfriend declared it as his new favourite chicken recipe. 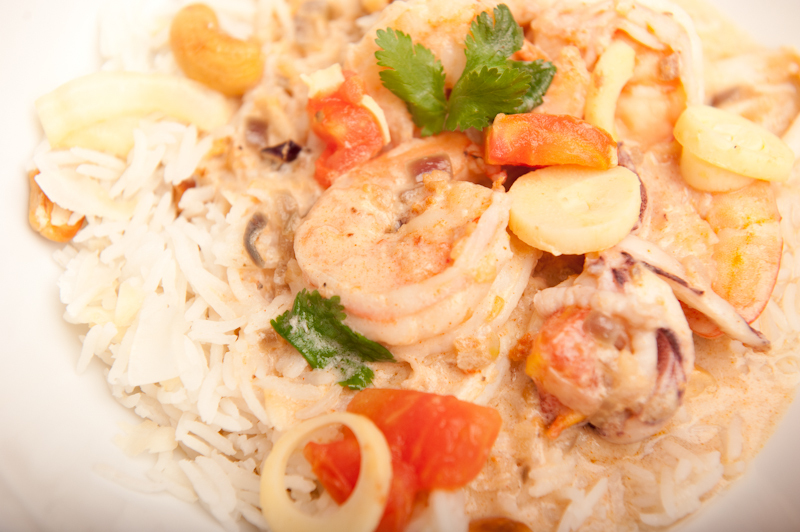 Moqueca is a traditional Brazilian seafood stew that has a long history. 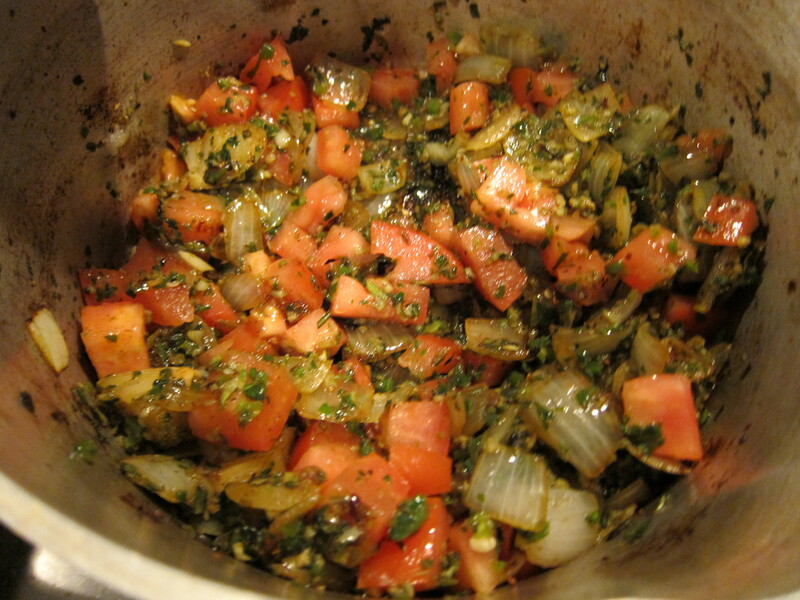 It is composed of fish, tomatoes, garlic, onions and cilantro, with no water added. 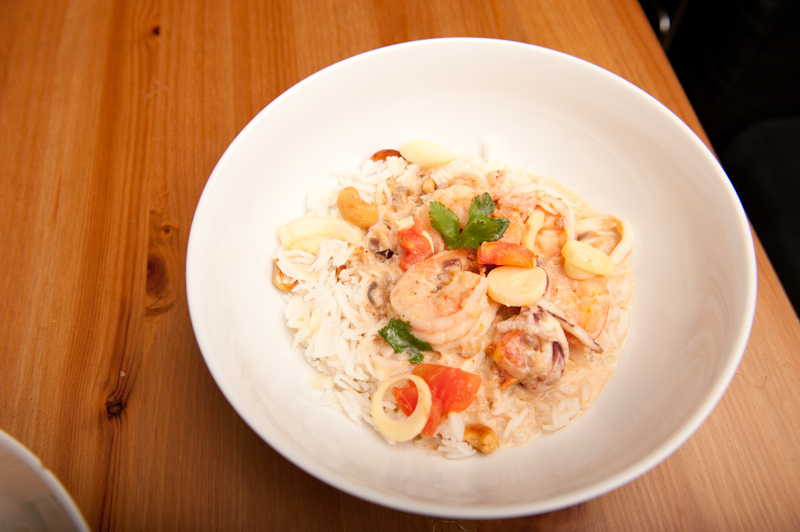 Moqueca from Bahia is influenced by African cuisine, and in addition to the traditional ingredients, dende, or palm oil, coconut milk, and shrimp are added to the stew. 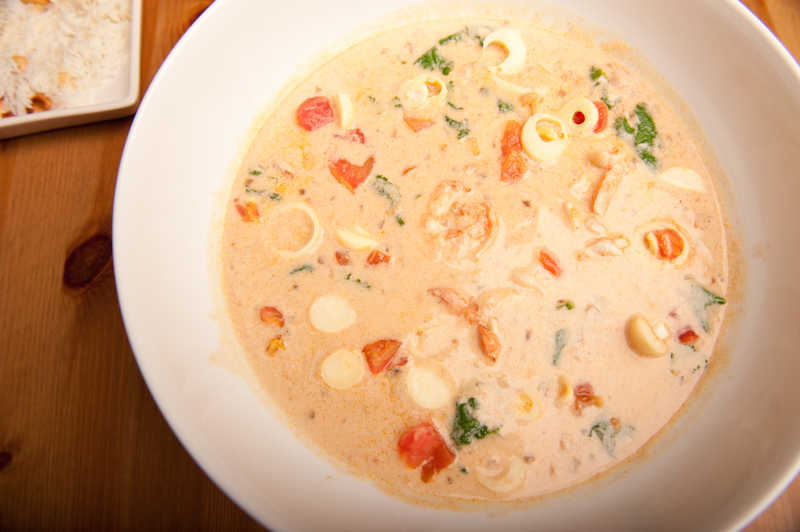 I decided to try a Moqueca Baiana recipe from Daniel Boulud, and turned out to be a creamy, almost curry like soup, packed with shrimp and squid, topped with tomatoes and hearts of palm. 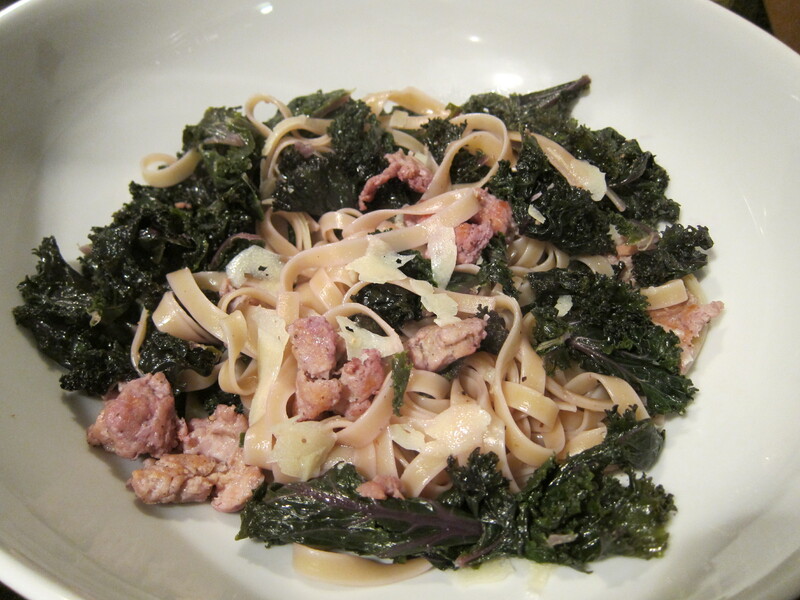 I made it for a weekday meal, but I think I would definitely make it again for a crowd. 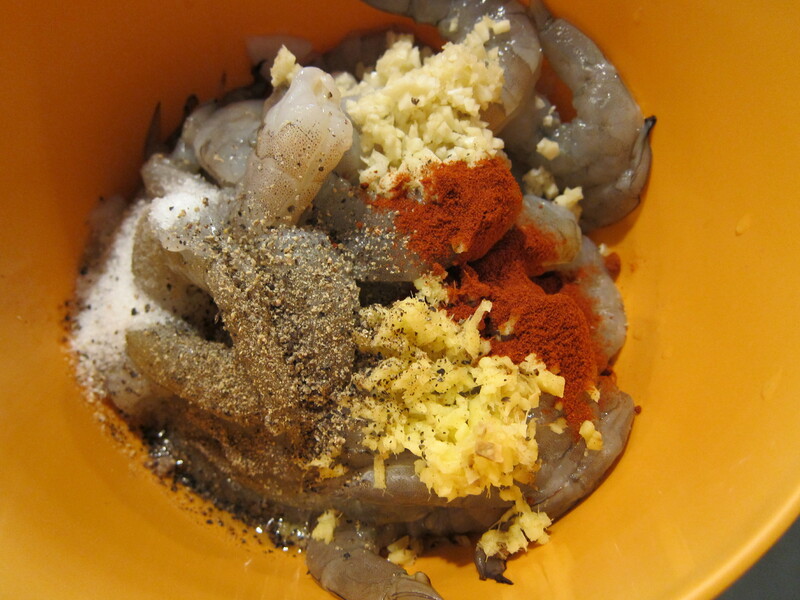 The shrimp is shelled and devined and mixed together the the rest of the seafood in a marinade of smoked paprika, garlic, ginger and dende oil ( I substituted peanut oil). The seafood is covered and refrigerated for at least 4 hours. 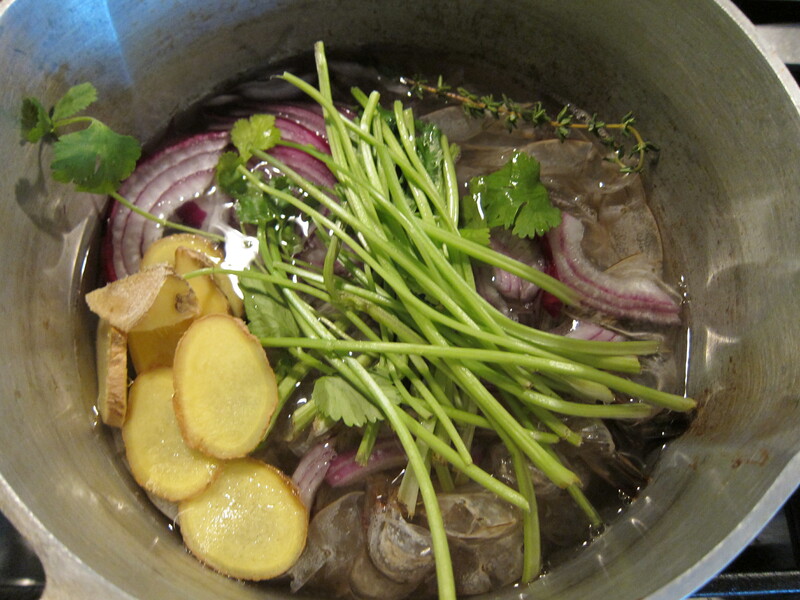 In the meantime, a stock is made out of shrimp shell, onion, ginger, cilantro stems, white wine vinegar, thyme and water. 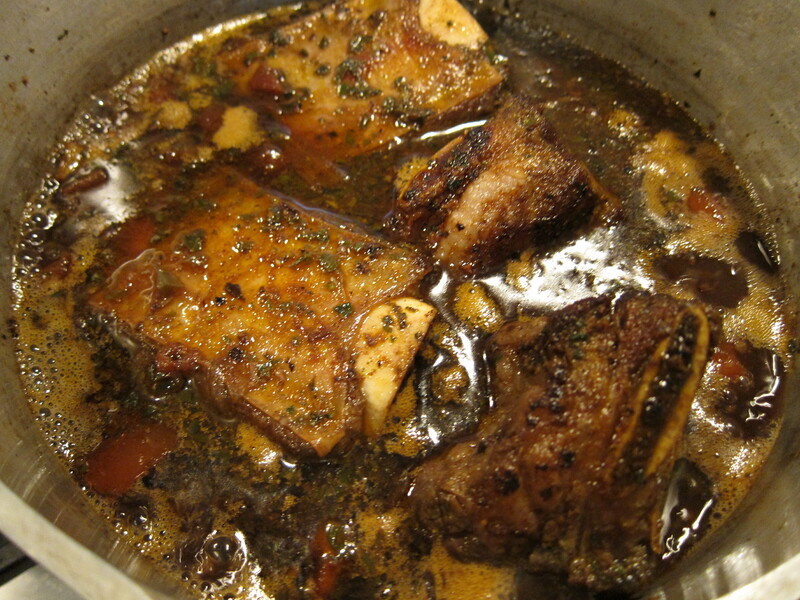 The stock is brought to a boil, and simmered for 45 minutes, then strained. 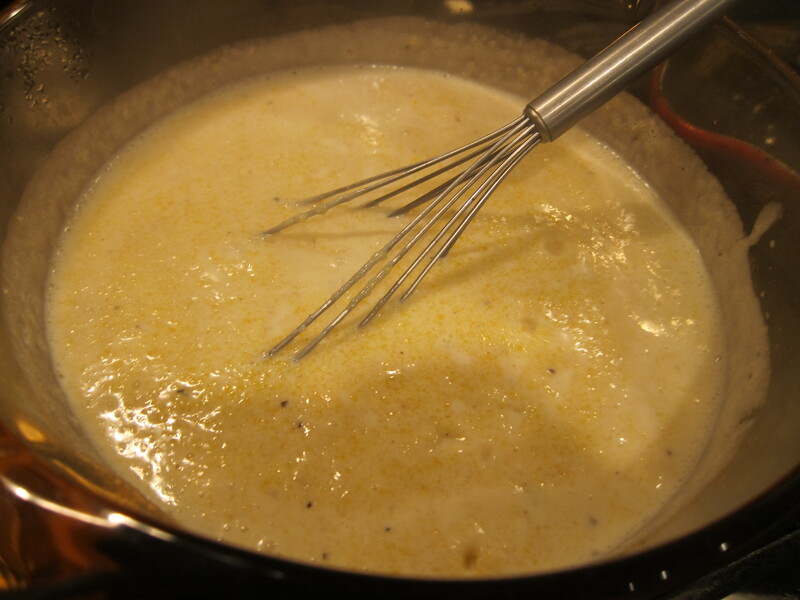 To make the soup, a roux of oil and flour is heated and cooked over low heat until foamy. Coconut milk and the shrimp stock is added to the pot and simmered for 5 minutes, and the soup is set aside and kept warm. 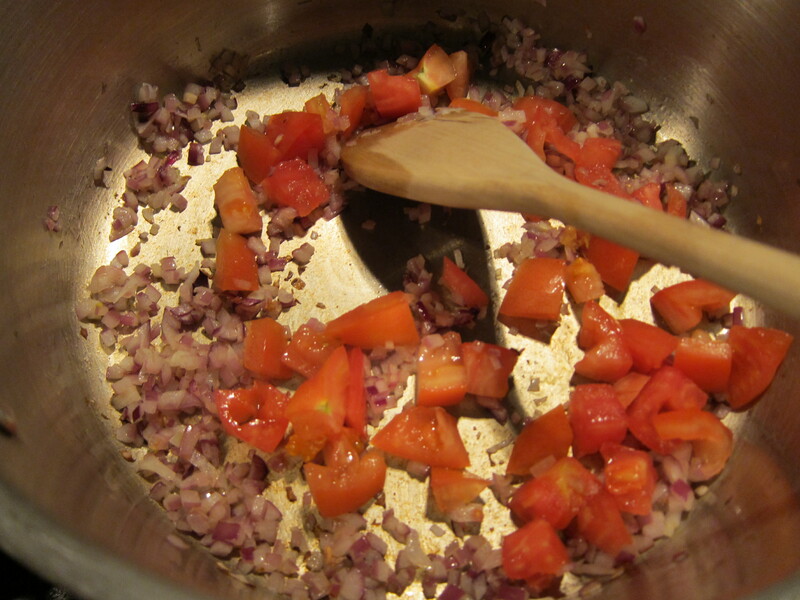 In another large pot, onion and tomatoes are sauteed until softened. 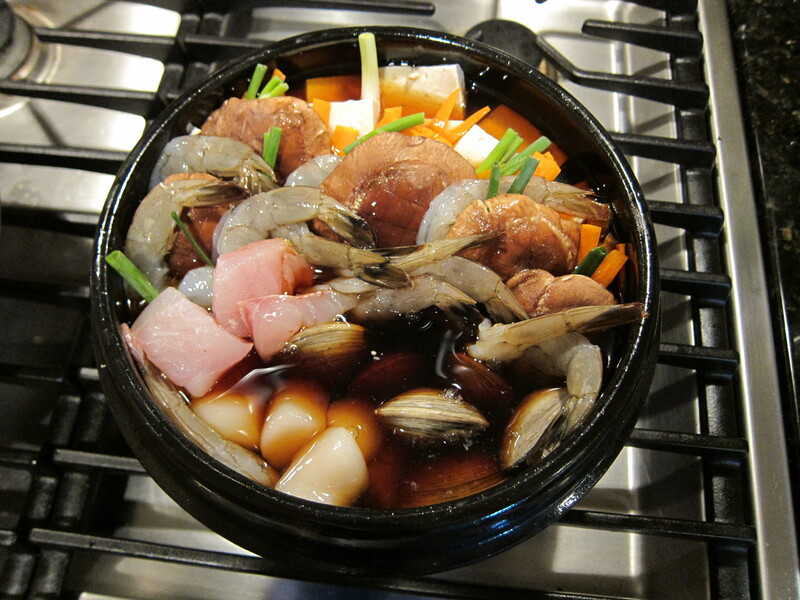 The marinated seafood is added to the pot and cooked for 2 minutes. 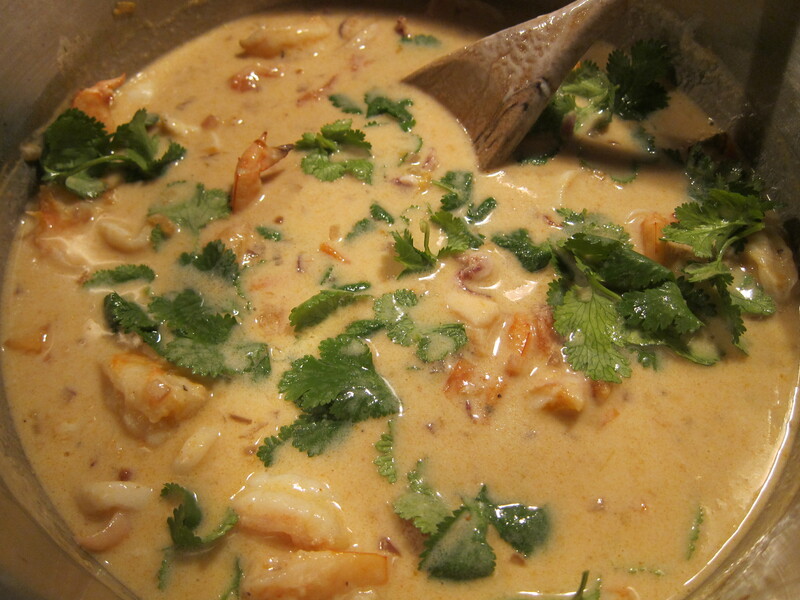 Soup is added to the pot and simmered until the seafood is cooked through, and the cilantro leaves are added to the pot. To make the toppings for the soup, fresh chopped tomatoes and heart of palm is cooked over high heat in a small pan for 1 minute. The tomatoes and heart of palm is added to the soup. I made coconut cashew rice to go with the stew, which is basically cooked Basmati rice heated over medium heat with roasted cashew and toasted coconut flakes. To serve, the rice is divided in bowls, and the seafood soup is ladled over the rice and topped with extra hearts of palm and tomatoes. To cap off the dinner, I chose a homemade Nutella Chocolate Tart recipe from Joanne Chang, who is a chemistry major turned baker based out of Boston. 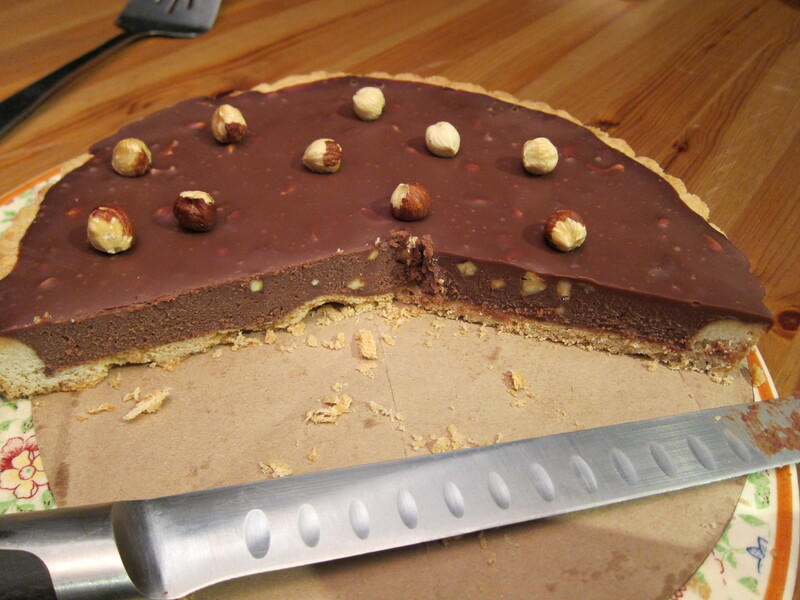 This is the first time I’ve tried making this tart, and I loved the contrast between the velvety creamy nutella and crunchy roasted hazelnuts. 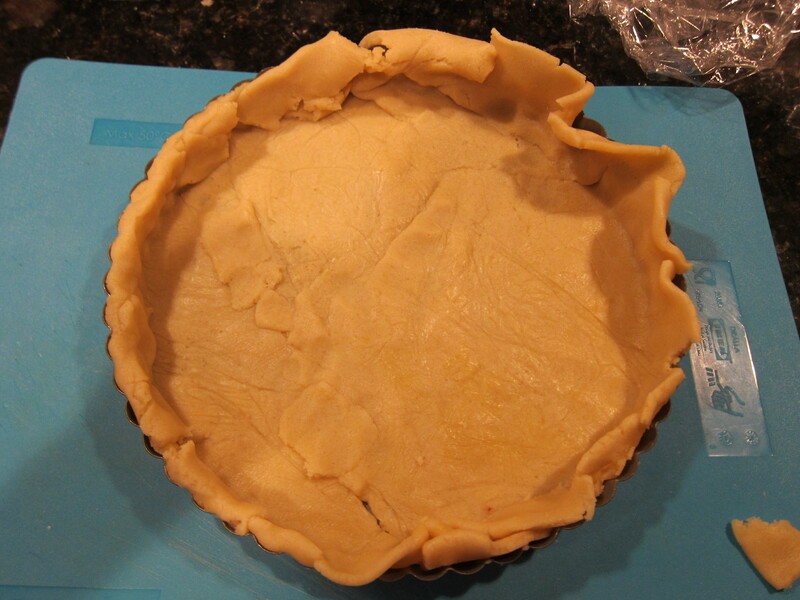 The crust is also very good, but the tart does take a little time to make . 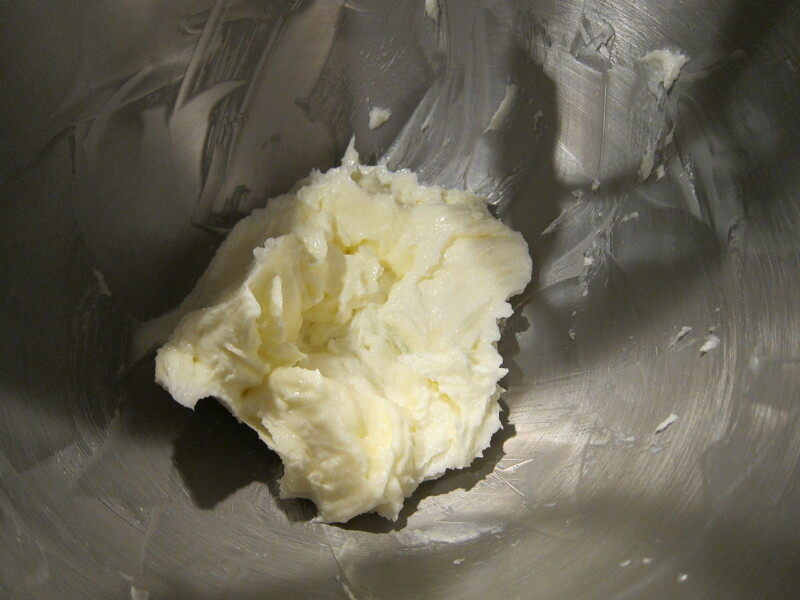 To make the crust, butter and sugar are whipped in a stand mixer until fluffy and light. 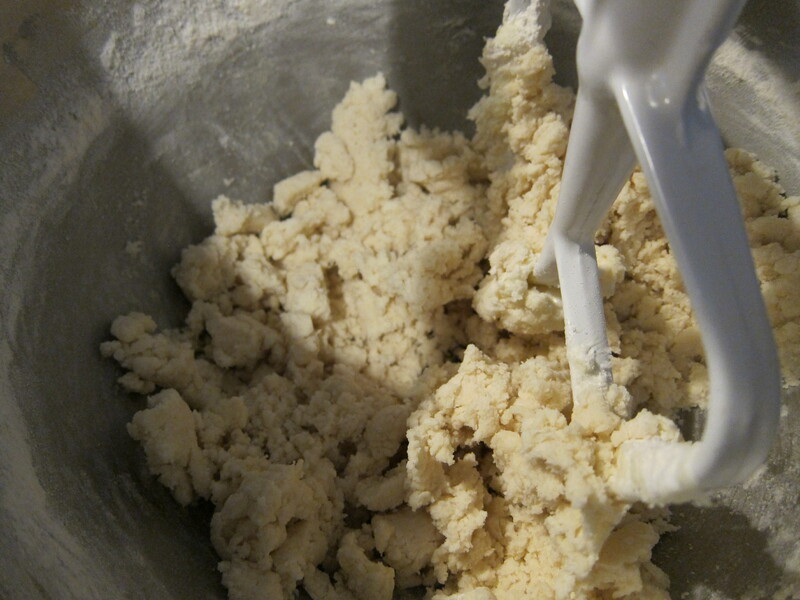 Flour is added to the mixer and beaten well with the paddle attachment. 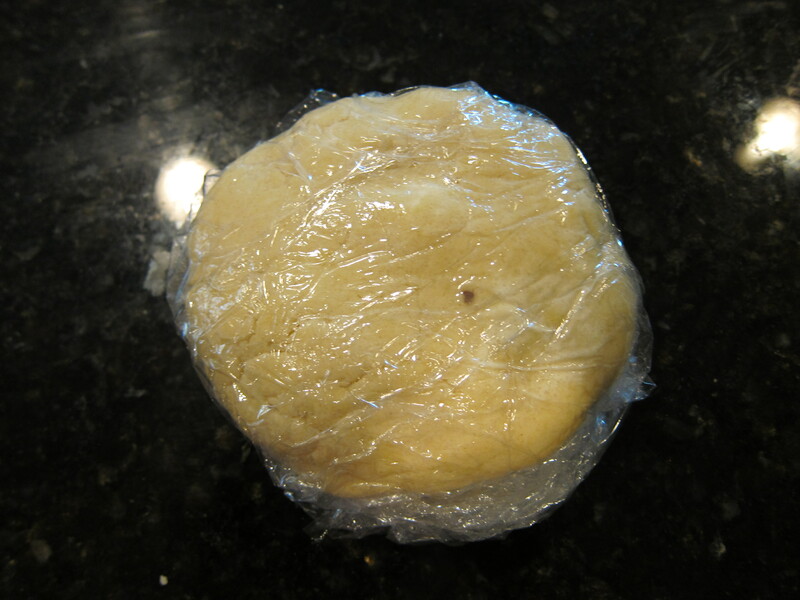 Once the dough comes together, it is formed into a ball, wrapped in plastic, and set in the fridge to relax for 1 hour. 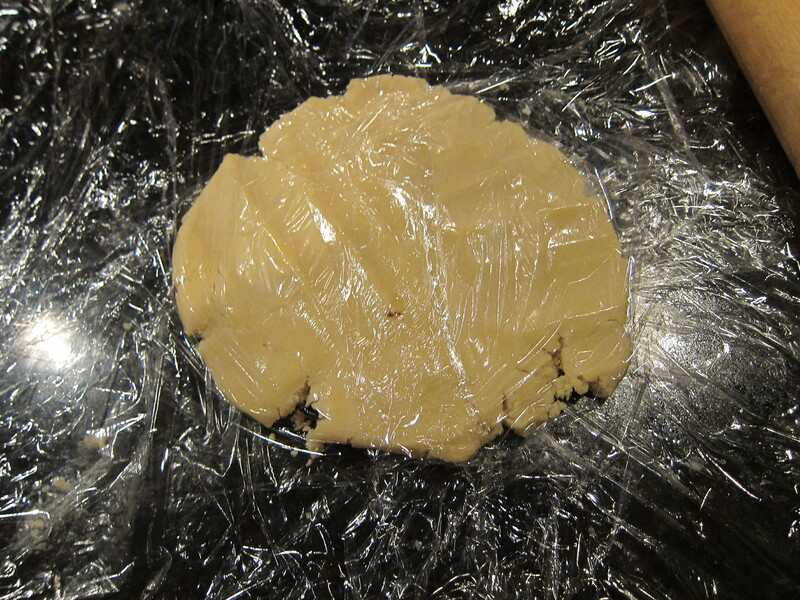 The dough is taken out of the fridge and left to soften for about 30 minutes, then beaten with a rolling pin to flatten and rolled out between two sheets of plastic wrap until about 12 inches in diameter. 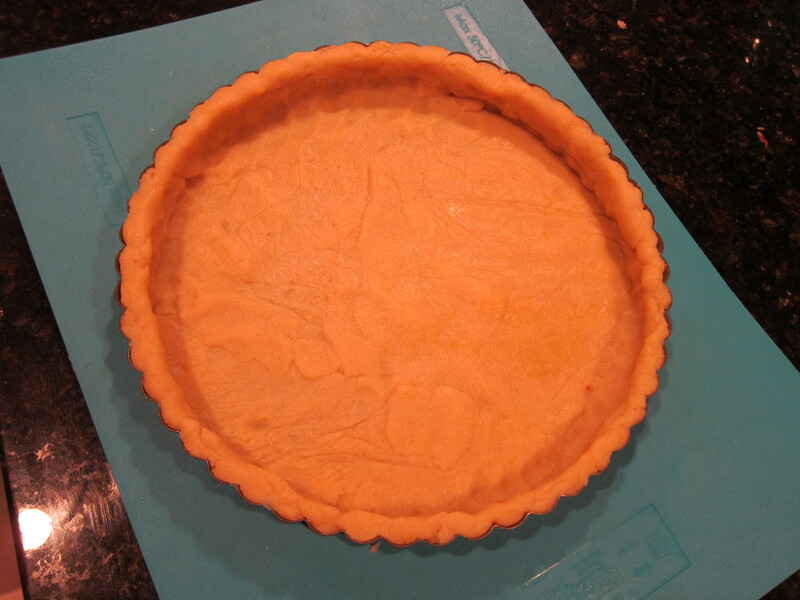 The dough is very carefully transferred to a metal tart pan with a removable bottom. The dough may break in places, but they are easily patch-able. The edges are folded in so it’s flush with the edge of the pan. 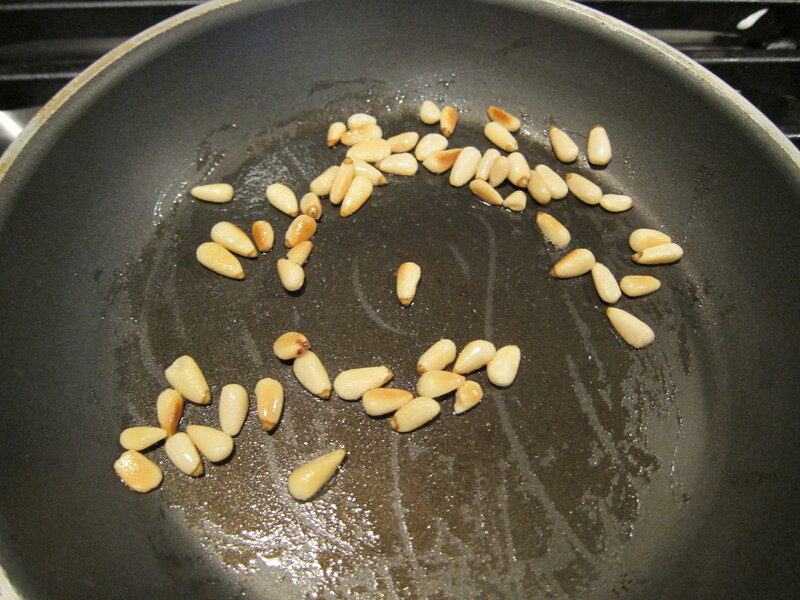 The tart shell is baked for 30 minutes until golden brown, then removed from the oven until cooled to room temperature. 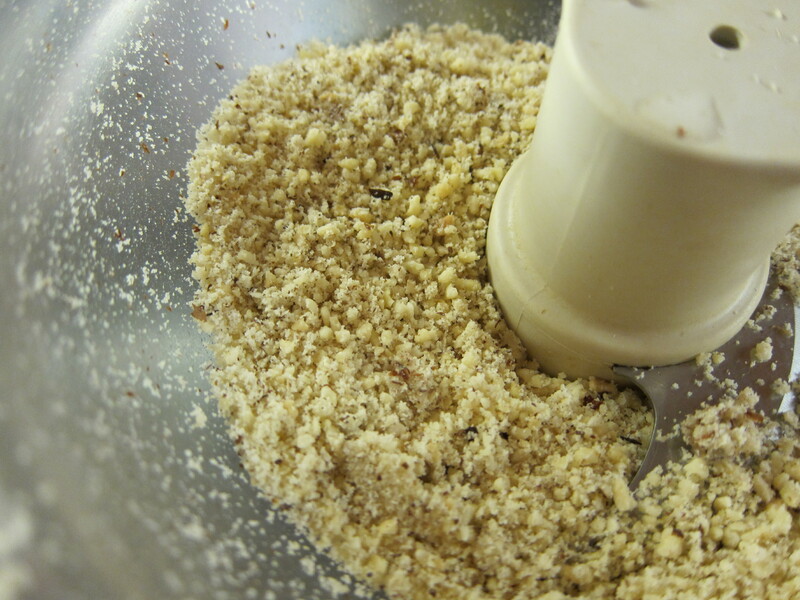 To make the nutella filling, toasted hazelnuts are processed until finely ground. 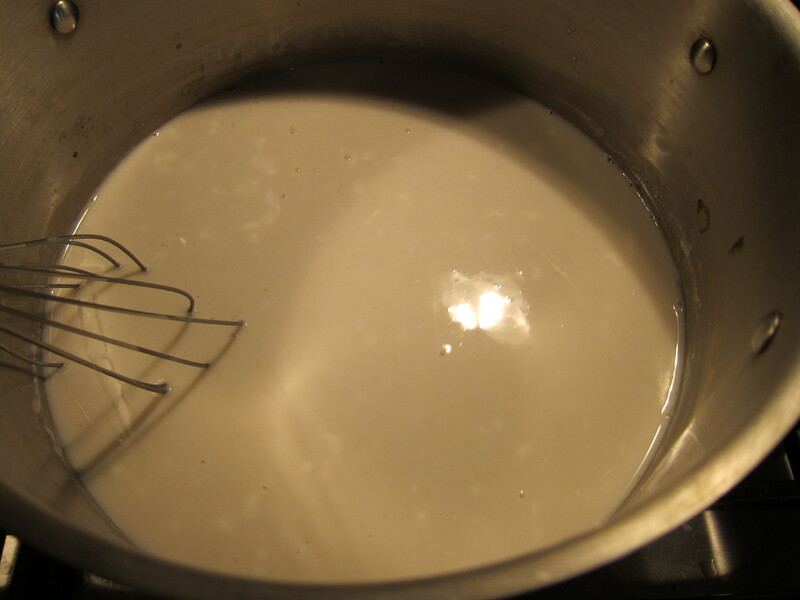 Heavy whipping cream is heated on the stove top until bubbles form on the edges of the pot, the ground hazelnut is added to the heavy whipping cream, the pot removed from the heat, and the cream is set to infused for an hour. While the cream is infusing, milk and bittersweet chocolate is melted in a metal bowl set atop a simmering pot of water until smooth. 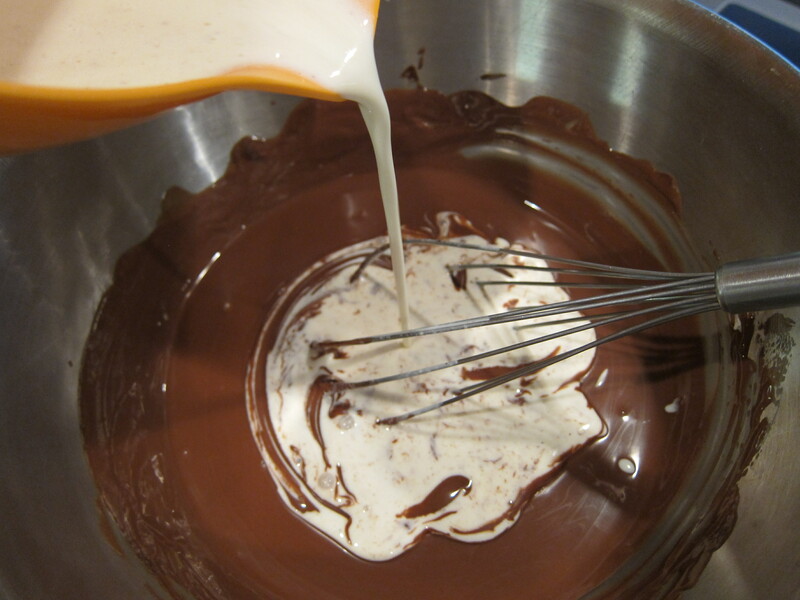 The whipping cream is strained and set aside until the chocolate is completely melted. 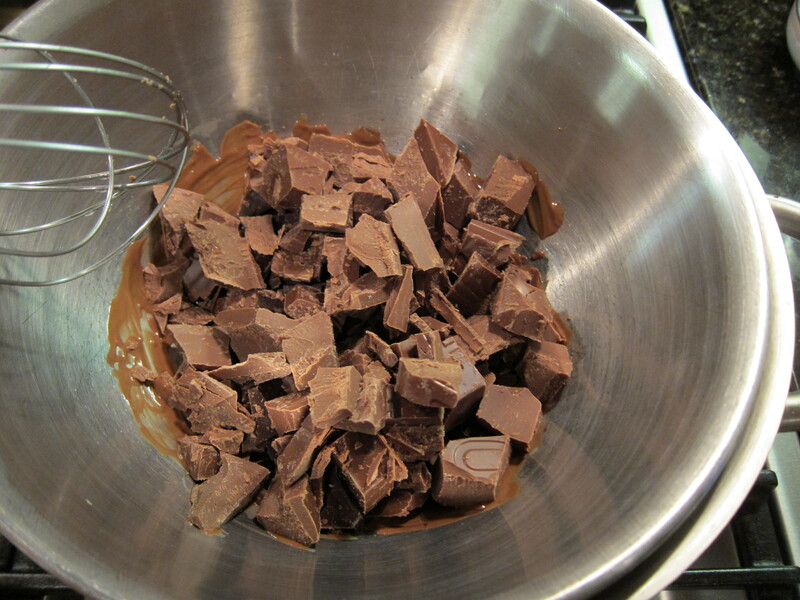 The cream is stirred into the melted chocolate until thoroughly mixed. 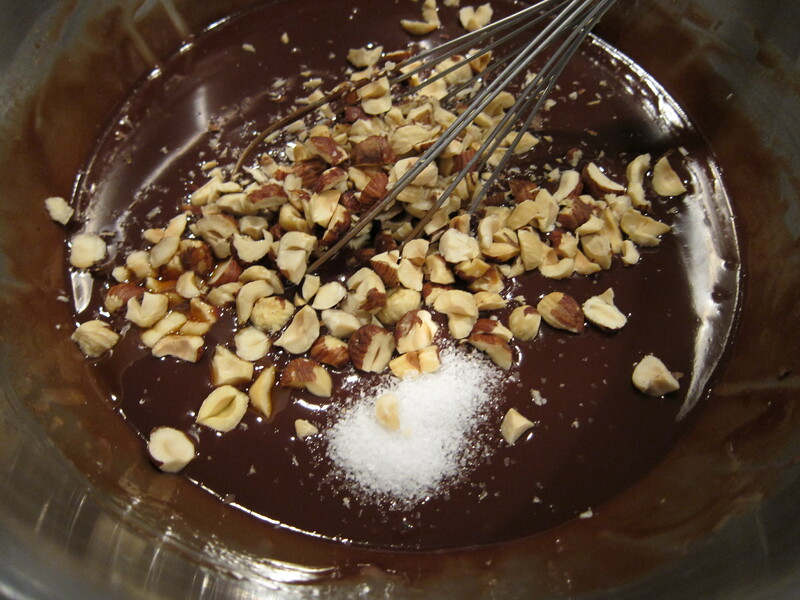 Crushed toasted hazelnuts are stirred into the chocolate, and the chocolate is ready to be used for the filling. 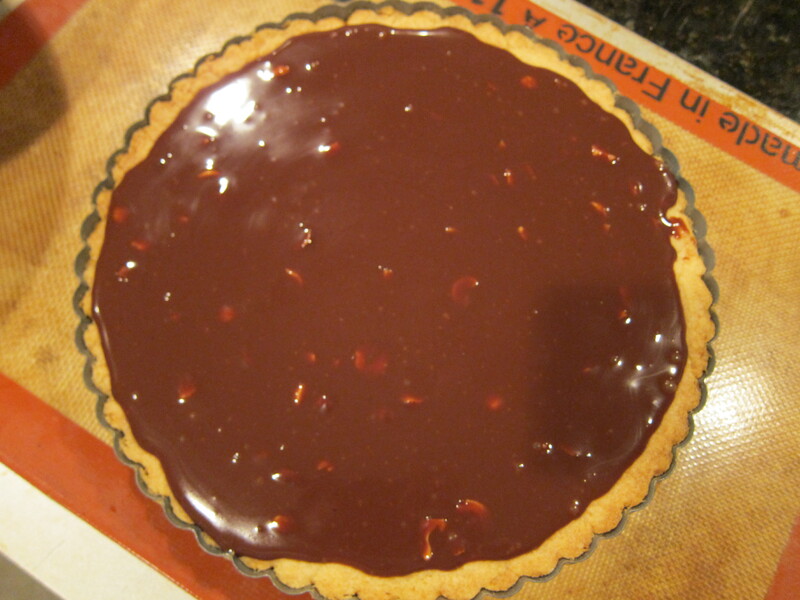 The tart is filled with the chocolate hazelnut mixture and placed in the fridge to chill. 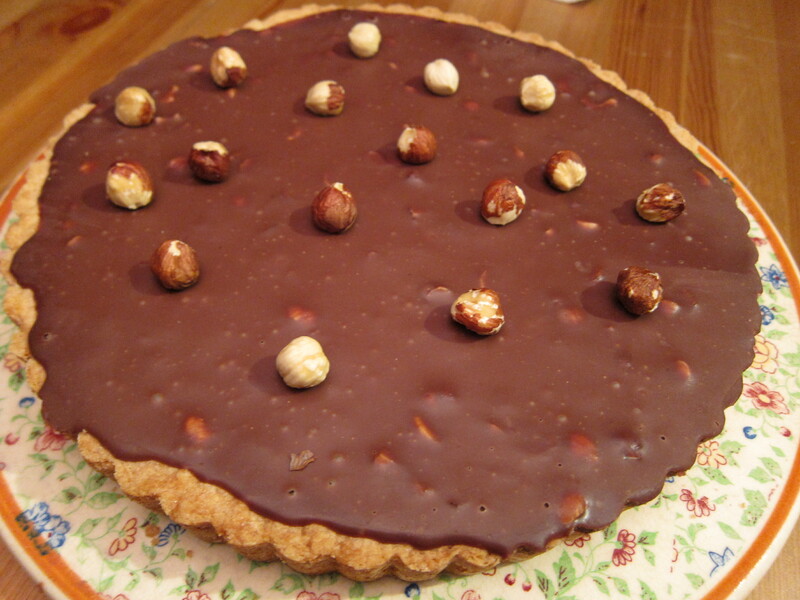 I topped the tart with some extra toasted whole hazelnuts. 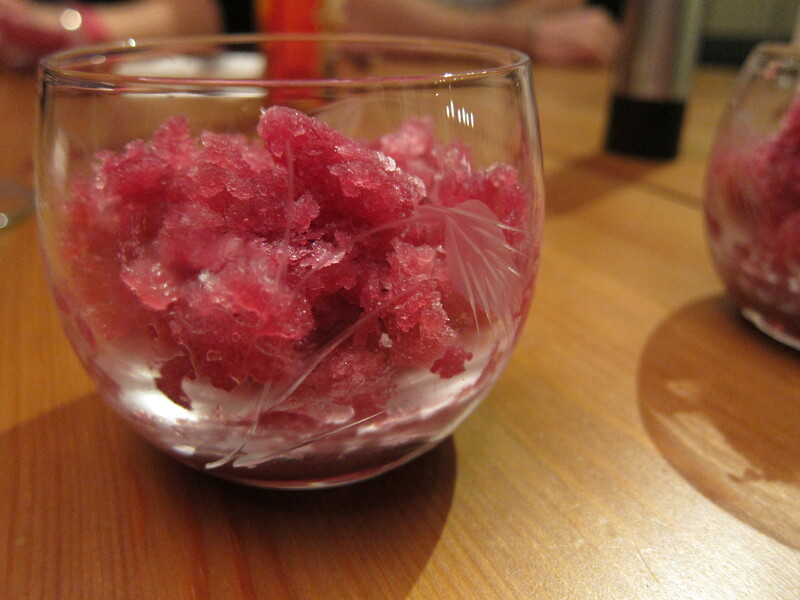 After the previous heavy short rib course, I served a refreshing concord grape granita, which is basically homemade shaved ice. I also made this a day in advance, and all I had to do to serve was scoop the ice into serving cups. 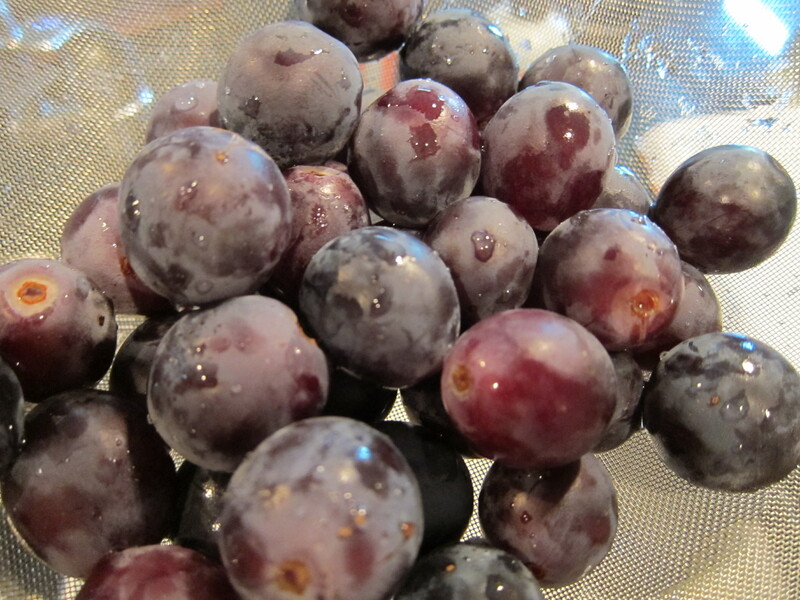 It’s important to get concord grapes for this recipe, since the grapes have a distinct flavour, and the skin lends a nice bright purple color to the ice. 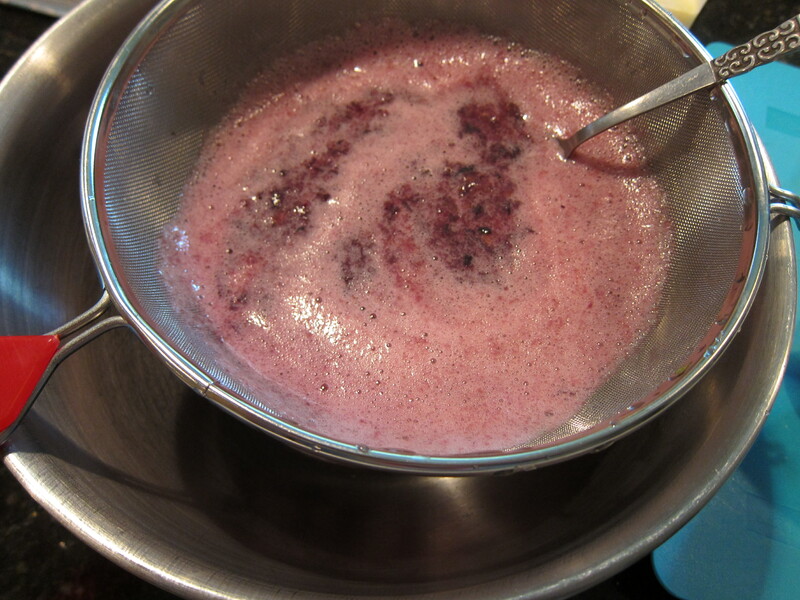 The grapes are washed and pureed in a blender, and the remnants set over a mesh sieve to remove seeds and left over grape skin. 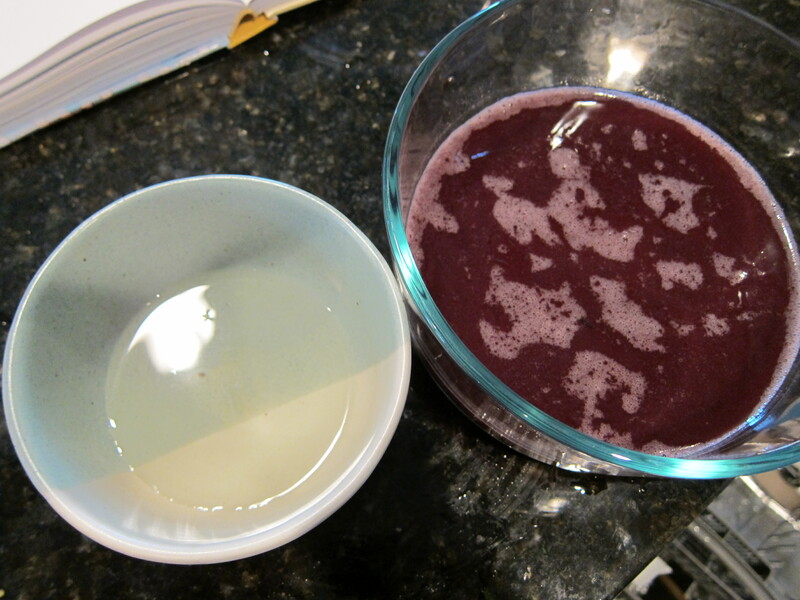 The grape juice is then mixed with simple syrup to taste. 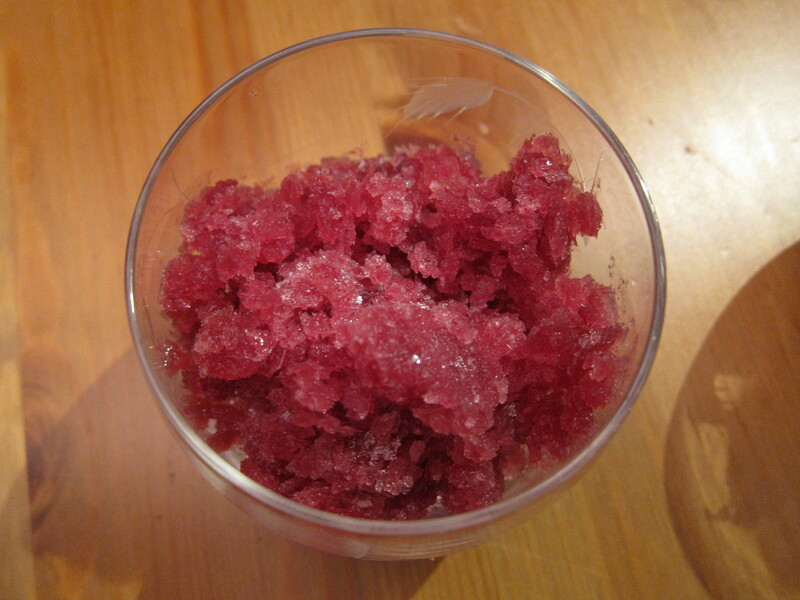 Remember that the grape juice is already pretty sweet, so be aware of how sweet you want the granita to be. 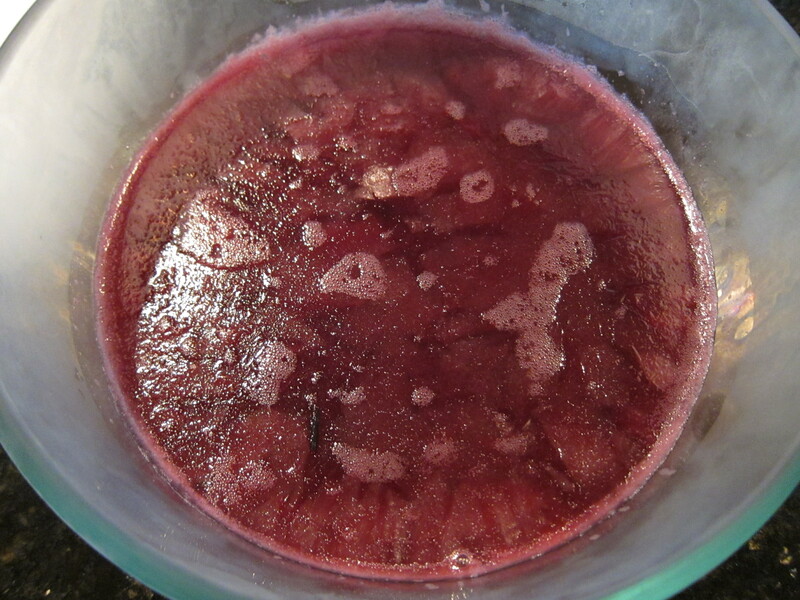 The grape juice/simple syrup mixture is placed in the freezer for a few hours until a thin layer of ice forms on the top of the liquid. The recipe says to check it every 30 minutes, but I think it depends on how strong your freezer is and mine took longer than 30 minutes to set. 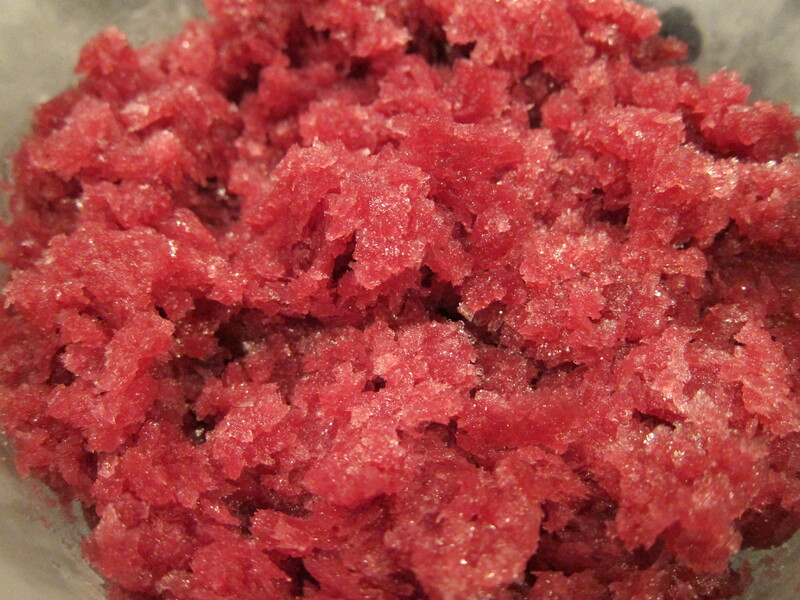 Using a fork, the top layer of the ice is scrapped and fluffed up. It doesn’t take that much effort at this point since the juice is only half frozen. 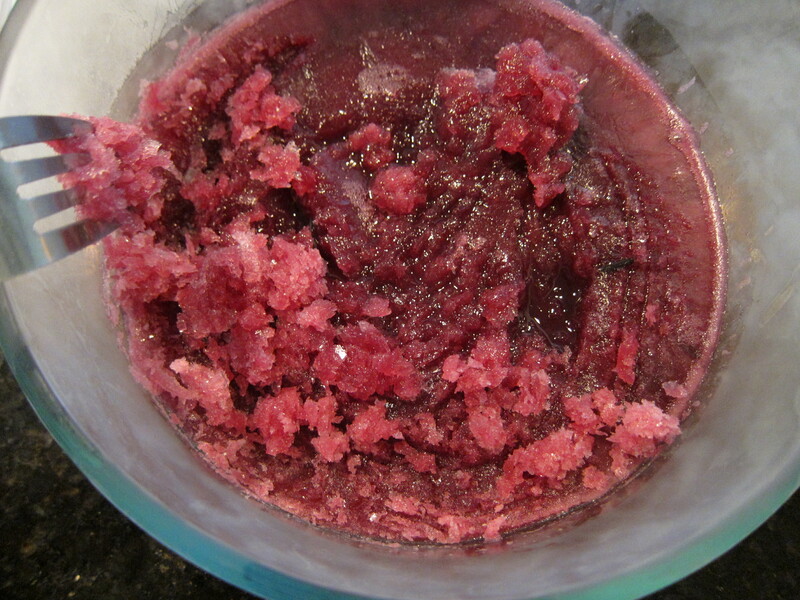 The mixture is placed back in the freezer for the bottom parts of the juice to freeze, and the same scraping process is repeated until the entire mixture is scraped up and frozen. The bowl is covered and placed in the freezer until ready to serve. I would’ve like to have topped the granita with a leaf or two of mint, but unfortunately I didn’t have any at the time. 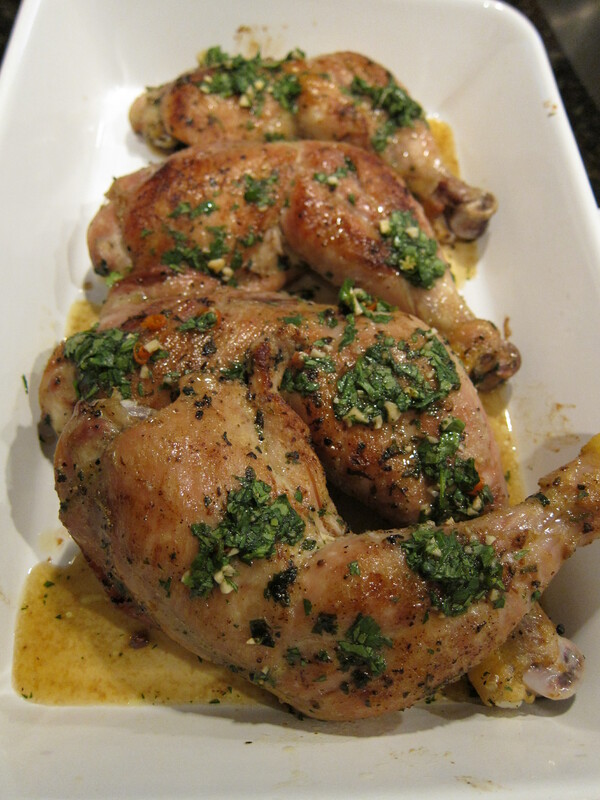 This was an incredibly easy recipe to make, and it was a great break for our dinner so far. For the final meat course, I made one of my favourite short rib recipes ever. I rarely repeat a recipe, unless the recipe is really good, and I’ve made these short ribs 3 times in the last 6 months. I came across this recipe when I was looking for a braised short rib filling for my Byggy Beef sandwich, and this is actually the first time I’ve made the short rib for themselves. The recipe is pretty involved and takes 3 days: first day for marinating the ribs, second day for cooking and resting the meat, the the third day serving. This also means that the significant amount of work can be done ahead of time, which makes this a great dinner party recipe. Since there were four of us, I bought 4 pieces of short rib, totaling 2.3lbs. Before marinating the ribs, I took time to cut and clean the extra fat and membranes from the top and bottom sides of the ribs. This will help make your ribs less greasy, and cleaner tasting. 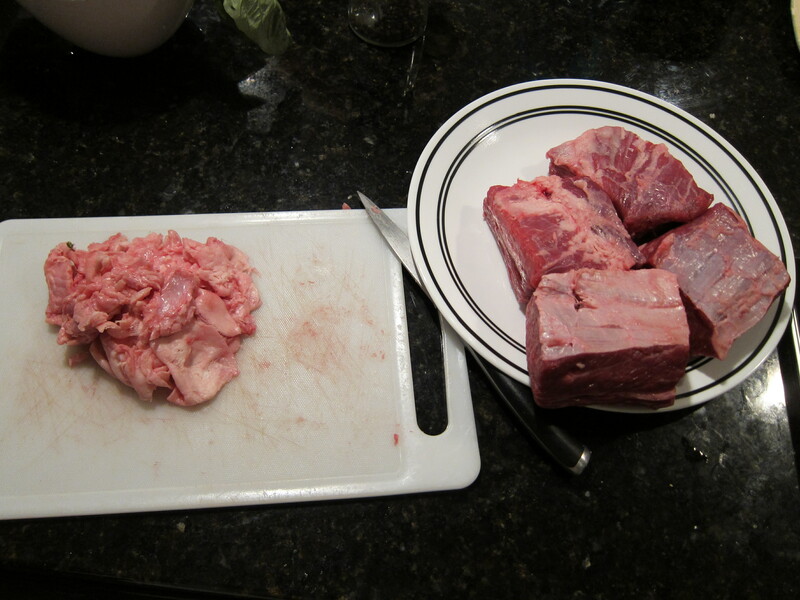 As you can see, quite a bit of fat was removed from these ribs. 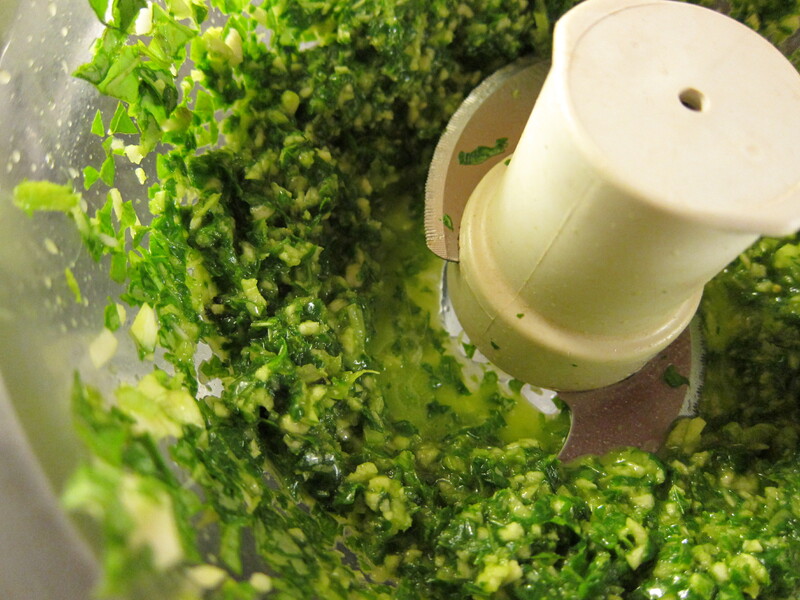 To make the marinade, fresh basil leaves and stems, garlic, and olive oil are processed together into a paste. The ribs are coated with the marinade in a plastic bag and chilled overnight in the fridge. 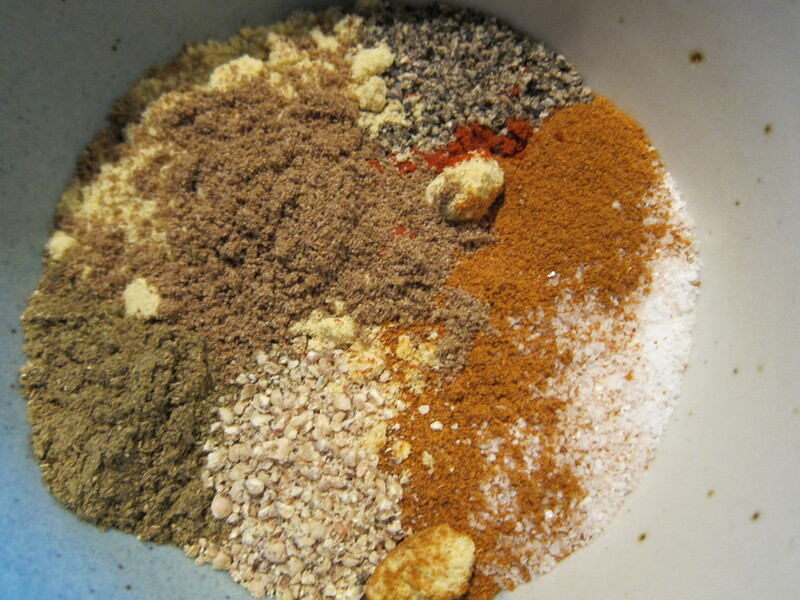 Meanwhile I made the short rib seasoning, which is composed of a lot of different spices. I halved the seasoning recipe and ended up with some extra that I will use for BBQing or making BBQ sauce. 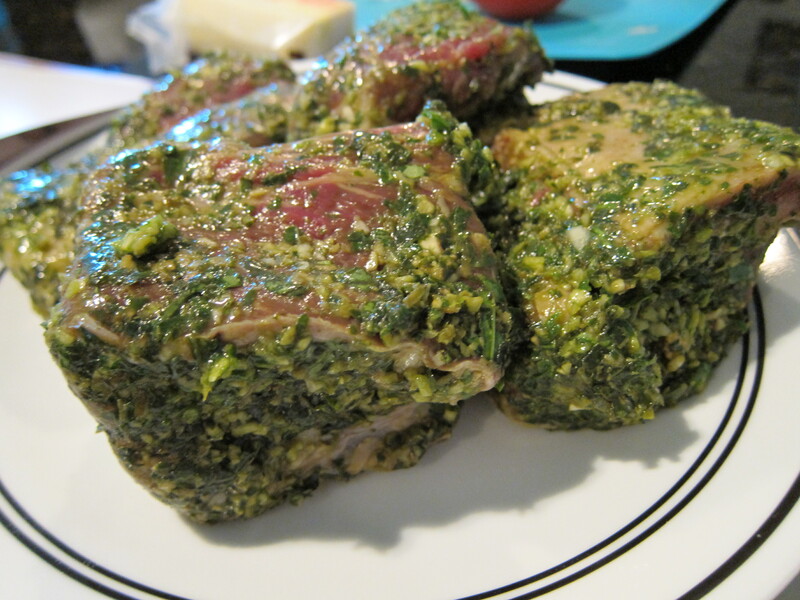 The next day, the short ribs are removed from the fridge and the marinade scraped from the ribs, and the marinade is reserved for use later in the recipe. 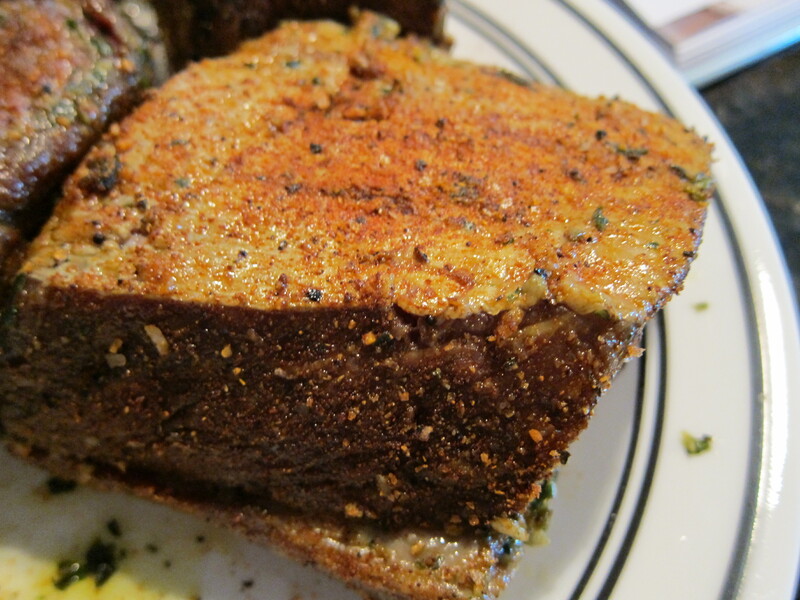 The ribs are coated with the short rib seasoning on all 4 sides. 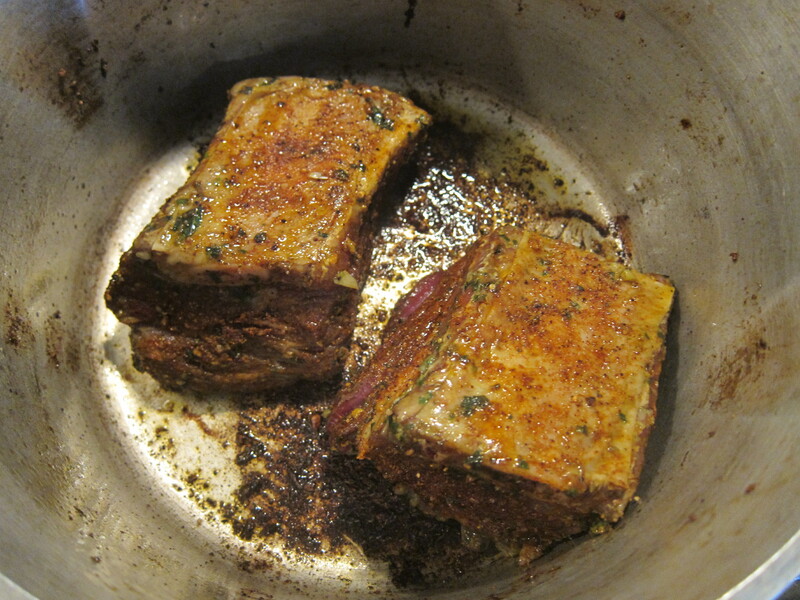 The ribs are browned on all 4 sides in a pot over medium high heat in batches. 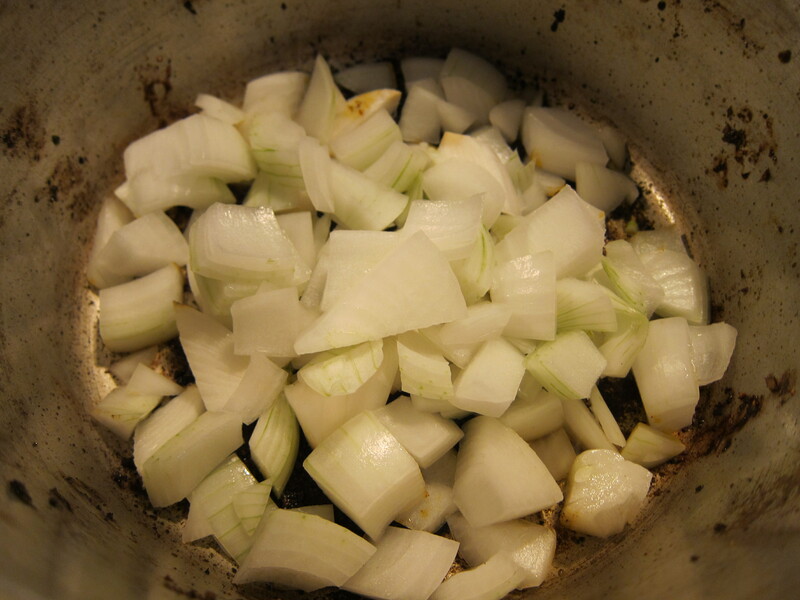 Chopped onions are then sweated in the pan over low heat until soft, then the heat is turned up until the onions are browned. 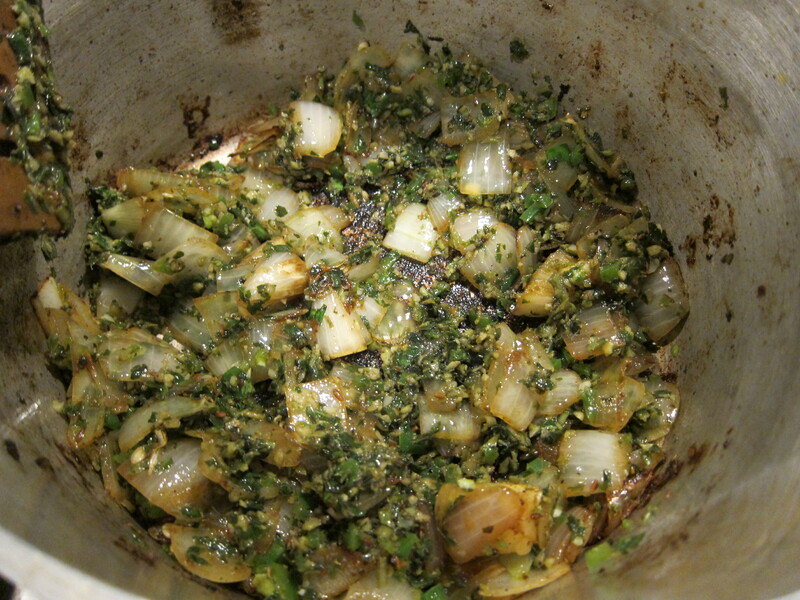 When the onions are tender, minced jalapenos and crushed toasted whole cumin seeds are added to the pot along with the reserved marinade. Chopped tomatoes are added to the pot and cooked until dry. 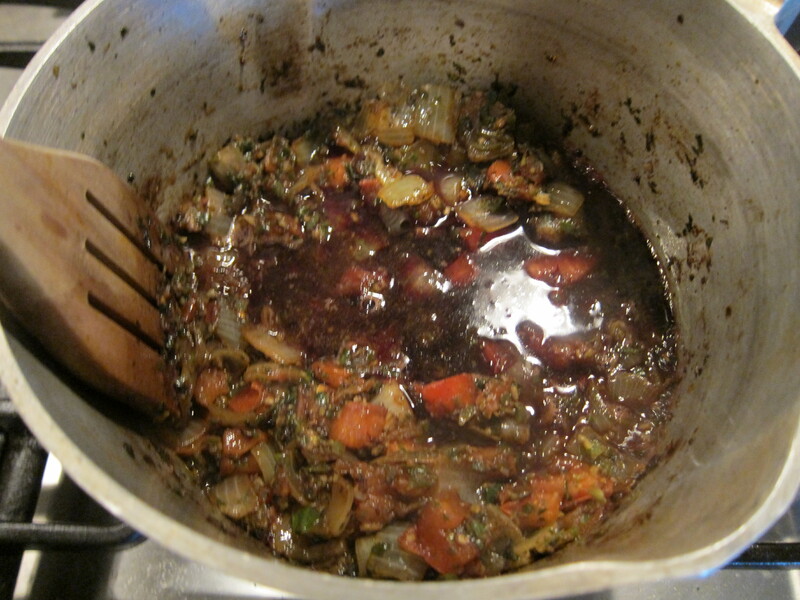 The wine is added to the pot to deglaze for about 3 minutes, scraping up the bottom browned bits. Chicken broth and cold coffee (which gives the ribs it’s redeye namesake) are added to the pot along with bay leaves, and the ribs are returned to the pot. The ribs are braised over low heat for 2 hours, and then taken off heat to cool to room temperature. The ribs should be placed in the fridge for at least 1 day to allow the flavours to develop and the meat to relax. 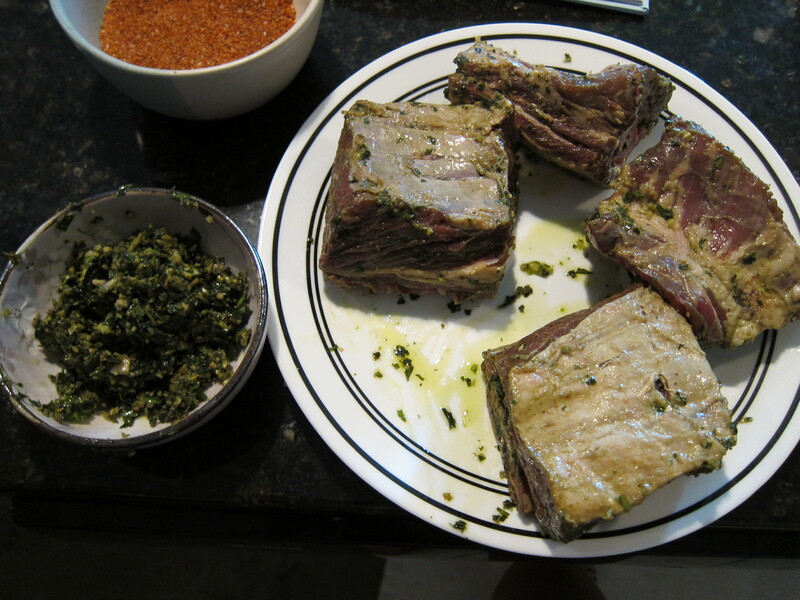 The next day, a layer of fat and oil would have congealed on the surface of the ribs, and you should scrape this layer of fat off before proceeding with the rest of the recipe. 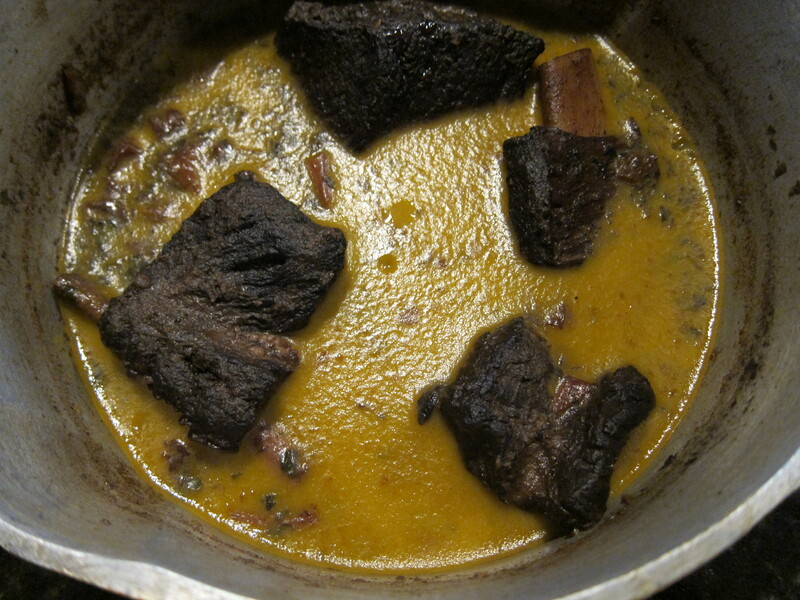 The pot is reheated over low heat, and the ribs are removed from the pot and set aside. The sauce in the pot is reduced until thick. 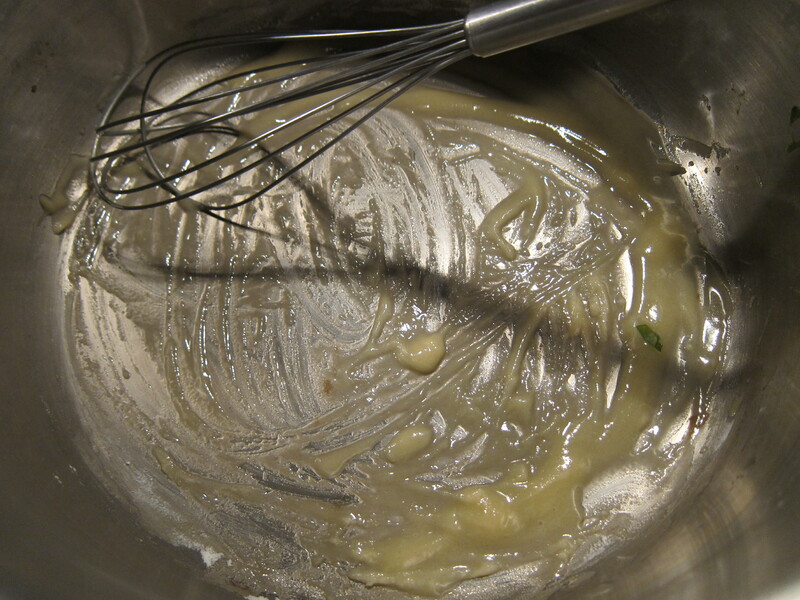 I also pureed the sauce just to break up the big bits. Tomato paste and red wine vinegar is added to the sauce to finish, and the meat is returned to the pot about 10 minutes before you are ready to serve, over low heat. To make the polenta, a mixture of heavy cream, chicken stock, butter, and fresh garlic is brought to a boil, and corn grits added to the pot. 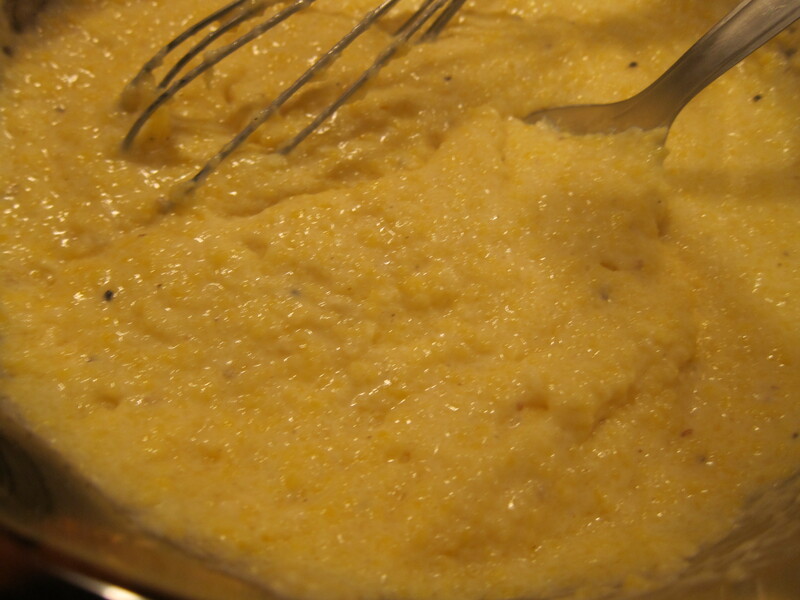 The polenta is whisked constantly, until the mixture thickens. 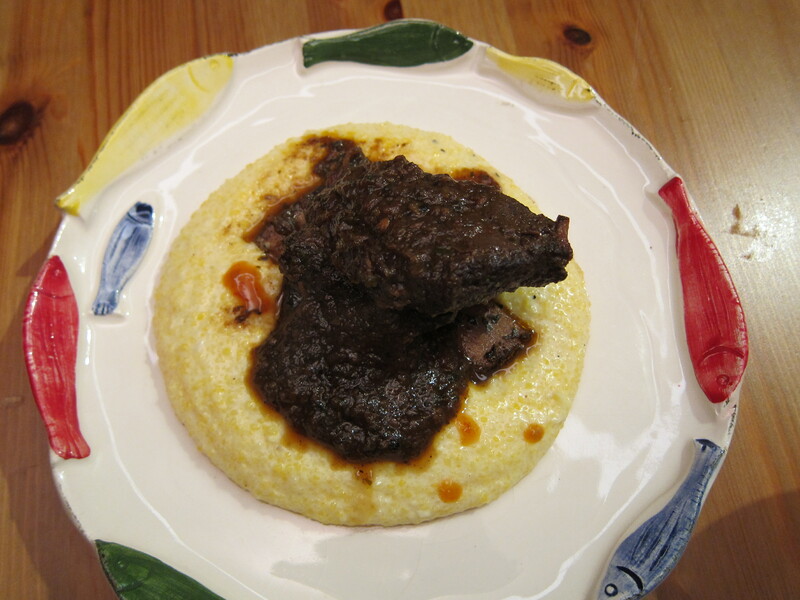 I also tasted the polenta often to test it’s tenderness. 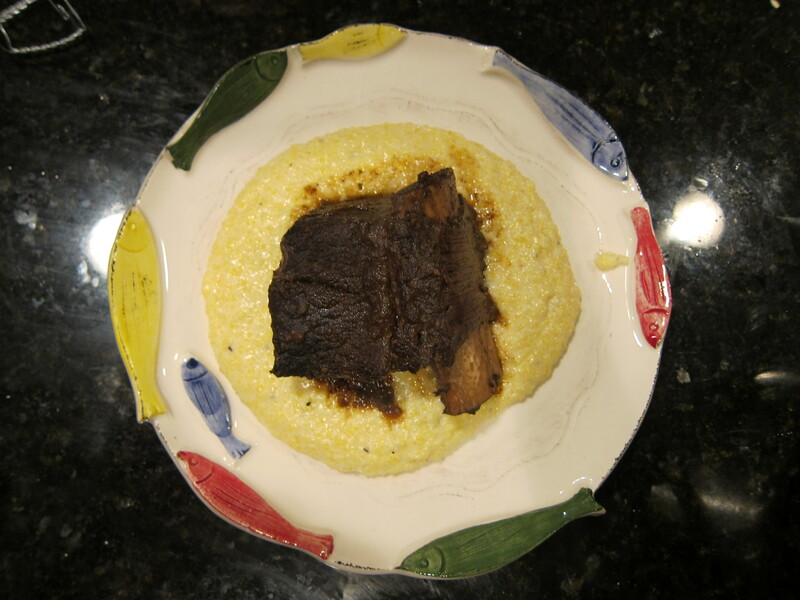 The polenta is spooned over a plate, and a short rib is placed in the center which extra sauce on the sides. I served the short ribs with vinegar based hot sauce.